How often have members of The Church of Jesus Christ of Latter-day Saints heard its critics proclaim, “There is no evidence for the Book of Mormon!” It is said so often by them that an ignorant person might well accept that statement as fact. However, that statement is nothing more than a mantra. A mantra is an idea or expression that is repeated frequently, often with the aim or effect of establishing the idea as truth when it is not established as such by evidence. The critics of the Book of Mormon hope that by saying that there’s “no evidence for the Book of Mormon” enough times, no one will dare question the truth of the statement. However, this sweeping statement always completely ignores and never attempts to address the volumes of written works composed on the subject of evidence for the truthfulness of the Book of Mormon. This article will attempt to clear the air and present the reader with evidences of a spiritual, physical, textual, and archeological nature, that the Book of Mormon is indeed the ancient record that the Prophet Joseph Smith claimed it was, and not a fabrication. Before we delve into the various evidences of the Book of Mormon, for the benefit of the reader who may not be as familiar, we will provide a brief introduction to the Book of Mormon. 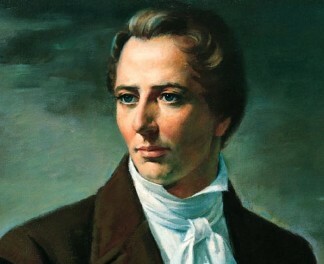 In 1820, a fourteen year old from upstate New York named Joseph Smith had a vision of God and Jesus Christ, wherein they told him that the existing churches were false “and I [Joseph] was expressly commanded ‘to go not after them,’ at the same time receiving a promise that the fullness of the Gospel should at some future time be made known unto me” (Joseph Smith, Encyclopedia of Joseph Smith’s Teachings, p. 267). Three years later in 1823, while praying to the Lord at his bedside, seventeen year old Joseph Smith was visited by an angel named Moroni. As Joseph recounted, “He [Moroni] said there was a book deposited, written upon gold plates, giving an account of the former inhabitants of this continent, and the source from whence they sprang. He also said that the fulness of the everlasting Gospel was contained in it, as delivered by the Savior to the ancient inhabitants” (JS-H 1:34). 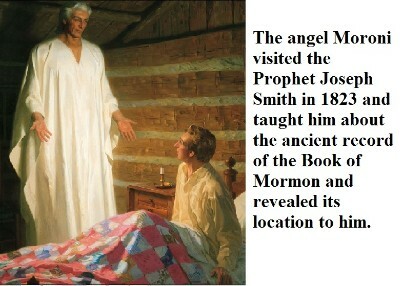 Moroni then showed Joseph Smith where they were to be found not far from his home in a hill called Cumorah. 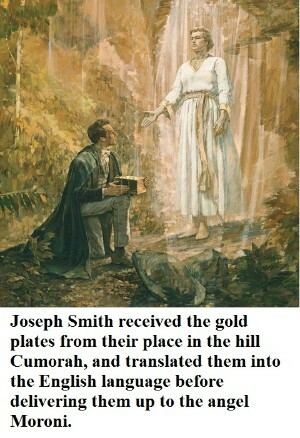 After several years Joseph Smith eventually received the gold plates and translated them “by the gift and power of God” into English (Joseph Smith, History of the Church 1:315). Joseph Smith said that “the Book of Mormon was the most correct of any book on earth, and the keystone of our religion, and a man would get nearer to God by abiding by its precepts, than by any other book” (Joseph Smith, Teachings of the Prophet Joseph Smith, p. 194). In fact, the truthfulness of the Book of Mormon is so crucial that the veracity of the entire Latter-day Saint faith hangs upon it, as the Prophet said: “Take away the Book of Mormon and the revelations, and where is our religion? We have none” (ibid., p. 71). The Book of Mormon recounts God’s dealings with four major groups of people. 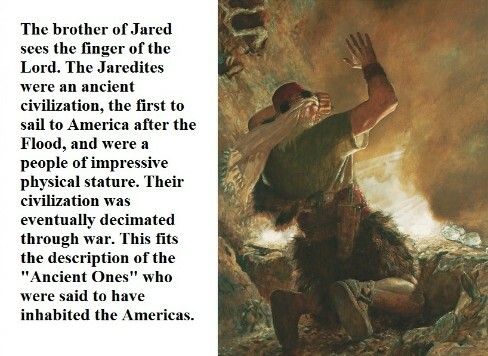 The earliest group of people was known as the Jaredites, and they originated at the Tower of Babel in the days following shortly after the Flood of Noah. At the confusion of tongues, they were led by God across the sea to the American continent and there developed a great civilization spanning from approximately 2200 B.C. to 600 B.C., but it was eventually destroyed through war. Next came a group led by a prophet named Lehi, which fled Jerusalem in 600 B.C. at the command of God, to escape its impending destruction at the hand of the Babylonians. The Lord also led them to the American continent where they split into two major factions, the Nephites, who were white and fair-skinned, and the Lamanites, who were darker-skinned. Another group mentioned in the Book of Mormon but which does not receive much attention is the people of Mulek, or the “Mulekites,” who were led across the sea to America by the son of the Jewish king Zedekiah, who also fled Jerusalem to escape destruction. The Book of Mormon chronicles the visit and teachings of prophets among these people, and eventually the personal visit of Jesus Christ after His resurrection. In time, all of these civilizations were destroyed until only the Lamanites remained, and from them descended the people we know as the American Indians. Moroni, the virtual last survivor of the Nephites and the last prophet to write in the Book of Mormon, buried the record around 421 A.D. for the purpose of it coming forth in the latter days. And that brings us full circle back to where the Joseph Smith story commences. The coming forth of the Book of Mormon, the most important Book of our time, was of course foreseen long ago. Referring to the Book of Mormon, which was buried in the Hill Cumorah, the Psalmist wrote, “Truth shall spring out of the earth; and righteousness shall look down from heaven” (Psalms 85:11), meaning that the Book of Mormon would come forth from the ground, and that the heavens would open to restore the gospel. Likewise Isaiah wrote, “let the earth open, and let them bring forth salvation” (Isa. 45:8). The prophet Ezekiel wrote of “the stick [i.e. scroll or scripture] of Joseph” becoming one with the “stick” or scriptural record of Judah (see Ezek. 37:15-20). The stick of Joseph is the Book of Mormon, as its writers and people were of the Josephite lineage. The stick of Judah is, of course, the Bible, having been written principally by Jews and preserved for the world by the Jews. Also, the Savior Jesus Christ referred to the people in the Book of Mormon on the American continent when he declared, “And other sheep I have, which are not of this fold: them also I must bring, and they shall hear my voice; and there shall be one fold, and one shepherd” (John 10:16. cf. 3 Ne. 15:13-17). And John the Revelator saw in vision the angel Moroni revealing the Book to the world in the latter days: “And I saw another angel fly in the midst of heaven, having the everlasting gospel to preach unto them that dwell on the earth, and to every nation, and kindred, and tongue, and people” (Rev. 14:6). “I went to the city of New York, and presented the characters which had been translated, with the translation thereof, to Professor Charles Anthon, a gentleman celebrated for his literary attainments. Professor Anthon stated that the translation was correct, more so than any he had before seen translated from the Egyptian. I then showed him those which were not yet translated, and he said that they were Egyptian, Chaldaic, Assyriac, and Arabic; and he said they were true characters. He gave me a certificate, certifying to the people of Palmyra that they were true characters, and that the translation of such of them as had been translated was also correct. I took the certificate and put it into my pocket, and was just leaving the house, when Mr. Anthon called me back, and asked me how the young man found out that there were gold plates in the place where he found them. I answered that an angel of God had revealed it unto him. (Joseph Smith – History 1:64-65). 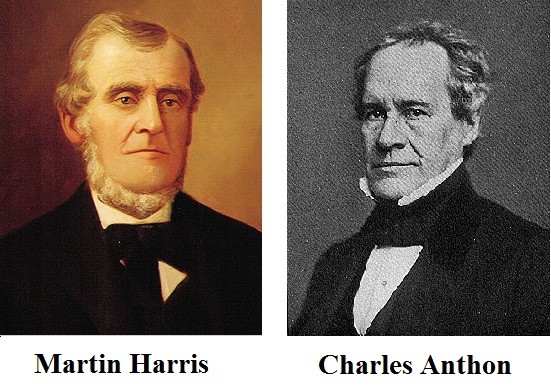 Professor Anthon actually denied meeting Martin Harris in 1834, no doubt due to embarrassment and humiliation with being associated with Mormon prophecy. However, later in 1841 he changed his story and confirmed that he had in fact met with Martin Harris (see Richard N. Skousen, Brother Joseph, vol 1, p. 94-95). “A few years later [from the time of their first meeting], after the Book of Mormon was published, Martin Harris made a special trip to Columbia University to present Professor Anthon with a copy of the Book of Mormon. By this time the Professor was so fearful of being identified with this record that he declined the gift and told Martin that if he left the book he would throw it after him as he departed” (ibid., p. 95). So then this is the meaning of the sealed book in this curious prophecy of Isaiah. The Isaiah prophecy of chapter 29 next commences to quote from the First Vision, wherein Joseph Smith was told, “that those professors [of the different Christian religions] were all corrupt; that: ‘they draw near to me with their lips, but their hearts are far from me, they teach for doctrines the commandments of men, having a form of godliness, but they deny the power thereof’” (JS – H 1:19). One of the most startling evidences of the Book of Mormon – and there are many – is also one of the very earliest, which was based on the law of eyewitness testimony. The Lord commanded through the Prophet Joseph Smith to Oliver Cowdery, David Whitmer, and Martin Harris: “And after that you have obtained faith, and have seen [the gold plates] with your eyes, you shall testify of them, by the power of God” (D&C 17:3). Thus the testimony of the Three Witnesses, and also an additional Eight Witnesses which also signed a sworn affidavit that they saw the gold plates, was to stand as a testament to and evidence for the Book of Mormon for all people and all time. In prophesying of this great future event, the prophet Nephi wrote, “and in the mouth of as many witnesses as seemeth him good will [God] establish his word; and wo be unto him that rejecteth the word of God!” (2 Ne. 27:14). 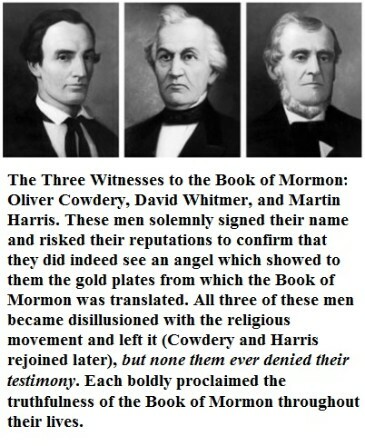 The Three Witnesses, which included Oliver Cowdery, David Whitmer, and Martin Harris, signed a sworn statement that they not only had “seen the plates,” but that “an angel of God came down from heaven, and he brought and laid [the plates] before our eyes, that we beheld and saw the plates, and the engravings thereon” (Testimony of the Three Witnesses). As to the Eight Witnesses, which included Christian, Jacob, Peter, and Peter Whitmer, Jr., as well as Hiram Page, Joseph Smith, Sr., Hyrum Smith, and Samuel H. Smith, they were simply shown the plates by the Prophet Joseph Smith. They signed a sworn statement that “the plates…have the appearance of gold; and as many of the leaves as the said Smith has translated we did handle with our hands; and we also saw the engravings thereon, all of which has the appearance of ancient work…. for we have seen and hefted, and know of a surety that the said Smith has got the plates of which we have spoken. And we give our names unto the world, to witness unto the world that which we have seen” (Testimony of the Eight Witnesses). The first thing we should ask is: how could someone hope to fake such events? How could someone in the rural nineteenth century fabricate the appearance of an angel coming down from the heavens in broad daylight, and make it actually believable? How could Joseph Smith manufacture gold plates, when he himself was poor and did not have the requisite metallurgical skills? The next option, after the idea that Joseph Smith was deceiving the Witnesses, is that of collusion between Joseph Smith and the Witnesses. But again we must ask: why? What material gain or positions of authority were these colluders given that would have made such an embarrassing public claim worthwhile? Especially when many of these Witnesses were excommunicated and cut off from the Church, what could possibly have been their motivation to retain their testimony of the Book of Mormon when they were in a perfect position to expose Joseph Smith for revenge? 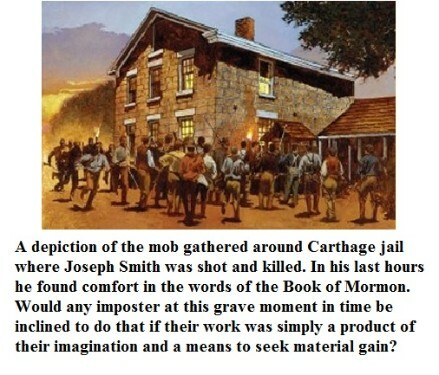 Gaining such loyalty from witnesses who would later leave the movement would be impossible for Joseph Smith to orchestrate if the Book of Mormon was a fraud. “Skeptics have discounted the ‘Testimony of Three Witnesses’ on the ground of collusion or deception. Yet each of the three was a respected and independent member of non-Mormon society, active in his community. Their lives, fully documented, clearly demonstrate their honesty and intelligence” (Daniel H. Ludlow, ed., Encyclopedia of Mormonism, vol. 1, p. 215). The third option, and the only one that makes sense with the behavior of the Witnesses to the Book of Mormon, was that their testimony was true. “To the end of their lives, each of the Three said he had seen the plates, and each of the Eight insisted that he had handled them. Most of the Eight and all of the Three Witnesses reiterated their Book of Mormon testimonies just before death” (Daniel H. Ludlow, ed., Encyclopedia of Mormonism, vol. 1, p. 216). in scorn at Cowdery in the hope of making him ridiculous before the court and jury. asking, ‘Is he a Mormon?’ Everybody wondered what Cowdery would say against such charges. my brother attorney on the other side has charged me with connection with Joseph Smith and the golden Bible. personage told us if we denied that testimony there is no forgiveness in this life nor in the world to come. (Improvement Era, Vol. XLVI. August, 1943. No. 8). “I submit this as yet one more evidence of [the Book of Mormon’s] truthfulness. In this their greatest—and last—hour of need, I ask you: would these men blaspheme before God by continuing to fix their lives, their honor, and their own search for eternal salvation on a book (and by implication a church and a ministry) they had fictitiously created out of whole cloth? (Jeffrey R. Holland, “Safety for the Soul,” Ensign, Nov. 2009). (Joseph F. Smith, Gospel Doctrine, p. 483). (Hugh W. Nibley, Since Cumorah, p. 138-139). One startling thing that even an armchair researcher can be dazzled by is how incredibly well the Book of Mormon corresponds with complex Biblical history and chronology, such as the reigns of Jewish kings and the conflicts of nations at particular points in Near Eastern history. These things are hard even for a well-read student to keep straight in their mind, let alone a young nineteenth century farmer in his early twenties, still very much a boy, to create an entire complicated epic which depends completely on harmony with such details. Aside from historical chronology, the Book of Mormon also corresponds very impressively with Bible doctrine and prophecies as well, and blends with the doctrine of the Bible masterfully in a way that is altogether unique for a young man interested in Protestantism of the nineteenth century. Such a mind to create even the concept of the Book of Mormon out of whole cloth, and meld its writings and precepts with the Bible, itself a very long and complex piece of source material, in such a way as to be totally seamless, is incomprehensible. (Susan Easton Black, Emma Smith: An Elect Lady, p. 20-21). Let us take a small example of an intricate detail in the Book of Mormon that illustrates the inherent complexity of the Book. We will recall that the Nephites in the Book of Mormon were “descendents of the Jews” (2 Ne. 30:4) and that the Jews were “them from whence [the Nephites] came” (2 Ne. 33:8). Of course, the Nephites were not literally descendents of Judah, but were descendents of Joseph through Manasseh (see Alma 10:3). What these passages identifying the Nephites with the Jews mean is that the Nephites were culturally Jewish. And it appears that the Nephites followed the Jewish calendar as well (although they counted the years according to their important events, such as the time that Lehi left Jerusalem, the beginning of the reign of the judges, and the day of the signs of the birth of Christ). For the Book of Mormon records that, “in the thirty and fourth year [since the time of the birth of Christ], in the first month, on the fourth day of the month” appeared all of the prophesied signs of destruction to accompany Christ’s death (see Hel. 14:20-25). It is keenly interesting that the first month of the year in the Jewish calendar is called Nisan, and corresponds with March/April of our modern Western calendar, which is the traditional Easter time in which Christ was crucified! Also, according to the revelations of Joseph Smith, Jesus Christ was born on April 6 (see D&C 20:1), which also corresponds with the Hebrew first month of Nisan. The Book of Mormon also certifies that the sign of Christ’s birth was given “six hundred years from the time that Lehi left Jerusalem…. in the commencement of the…year” (see 3 Ne. 1:1-4, emphasis added). And so small hidden details such as these, which are a few among many in the Book of Mormon, lend great weight to the case that the Book of Mormon is not a simple construct at all. (Hugh W. Nibley, Since Cumorah, p. 238-239). The Book of Mormon also contains long quotations of many chapters from the Biblical writings of Isaiah. In one of these passages, which in the Bible is the second chapter of Isaiah, the Book of Mormon reads: “And upon all the ships of the sea, and upon all the ships of Tarshish, and upon all pleasant pictures” (2 Ne. 12:16. See also Isaiah 2:16). The footnote in the present edition of the Book of Mormon reads, “The Greek (Septuagint) has ‘ships of the sea.’ The Hebrew has ‘ships of Tarshish.’ The Book of Mormon has both, showing that the brass plates had lost neither phrase.” What a marvelous evidence this intricate, seemingly insignificant and forgettable detail is for the authenticity of the Book of Mormon. Are we to believe that in writing the Book of Mormon Joseph Smith had for reference material a copy of the ancient Septuagint (i.e. Greek version of the Old Testament)? And then are we to believe that he noticed the small difference in these phrases between versions and combined them together into one in order to fabricate evidence for the Book of Mormon, and then after all this trouble simply failed to ever point out this very interesting detail to any of its readers? 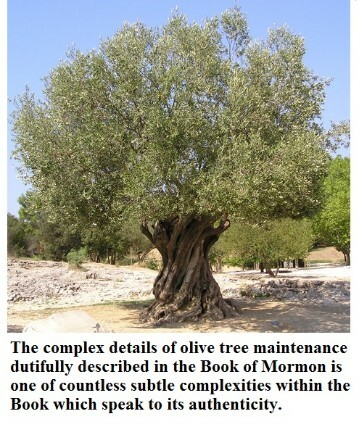 The Book of Mormon is simply a very complex arrangement. All of this would have been far too difficult to arrange for a young farm boy from rural upstate New York, who would have had neither the sophistication, the reference material, nor the adequate help of others. The improbability of Joseph Smith being responsible for the Book of Mormon, even with some aid, is further compounded when we consider the futility of anyone trying to fabricate such a thing at that time in the world’s history, when so little was known about future research that would later vindicate the Book of Mormon. As Hugh Nibley said, “There is no point at all to the question: Who wrote the Book of Mormon? It would have been quite as impossible for the most learned man alive in 1830 to have written the book as it was for Joseph Smith” (Hugh Nibley, Of All Things! Classic Quotations from Hugh Nibley, p. 143). While it is true that Joseph Smith claimed to have the gold plates in his possession from September 22, 1827 to the year 1830, it doesn’t follow that he had a full three years to concoct a clever story about some plates he did not actually possess. Joseph Smith was a poor farm laborer and would have devoted a large amount of his time to supporting his wife. As well, until Oliver Cowdery arrived on the scene and felt impressed to inquire about Joseph Smith and the plates, which led to him becoming a scribe for Joseph to dictate to, there was no one who could devote the kind of time to the effort of translating which it truly required. The best research on the subject indicates that Joseph Smith completed the translation of the Book of Mormon in only a mere 65-75 working days (see for instance Carlos E. Asay, In the Lord’s Service, p. 23)! As Richard L. Bushman observed, “John Welch and Tim Rathbone estimate that there were sixty-three translating days available from Oliver Cowdery’s start as secretary on 7 April 1829 to the end of June when the title page was published in the Wayne Sentinel. That comes to eight pages of printed text a day – a marvelous production rate for any writer and a stupendous one for an uneducated twenty-three-year-old who, according to his wife, could scarcely write a coherent letter” (Richard L. Bushman, Book of Mormon Authorship Revisited: Evidence for Ancient Origins, Noel B. Reynolds, ed., p. 23). The question then remains, how could such a complex book, so detailed in its stories, doctrines, and corroboration with Bible events, prophecy, and doctrine, be completed in such a short amount of time? To fabricate a book as complex and Biblically coinciding as the Book of Mormon in such a short time span, and without necessary education and literary resources, would have been impossible. (John W. Welch, “A Book You Can Respect,” Ensign, Sep. 1977). As was mentioned, the Narrative of Zosimus was an ancient document familiar to early Christians, but it never gained much notoriety and it fell out of use around 850 A.D. (John W. Welch, Book of Mormon Authorship Revisited: Evidence for Ancient Origins, Noel B. Reynolds, ed., p. 325). “The first known reappearance in modern times of the Narrative of Zosimus was its translation into Russian from an Old Church Slavonic text in the 1870s, almost fifty years after the translation of the Book of Mormon into English” (ibid., p. 325-326). There is no way that Joseph Smith could have used the Narrative of Zosimus as inspiration or source material for the Book of Mormon. And yet, here we have an ancient text corroborating the story of the Book of Mormon in astonishing detail. 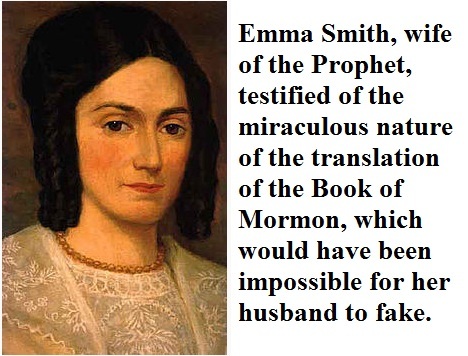 The claim of Joseph Smith is that he translated the Book of Mormon “by the gift and power of God” (Joseph Smith, History of the Church 1:315; see also D&C 1:29; 20:8), supernaturally by the use of seer stones, and not in any conventional translation method that would require study and research. According to Joseph Smith and his associates who assisted him, the Prophet simply dictated the text of the Book of Mormon, and a scribe sitting near to him wrote what he said. Contrast this with the common claim of Anti-Mormons, which is that Joseph Smith simply sat and wrote out the Book of Mormon himself from pure imagination. So the question is, is there any evidence that the Book of Mormon was in fact verbally dictated to a second person who was writing, just as Joseph Smith and his associates claimed? The answer is yes. Royal Skousen is the editor of the Brigham Young University Book of Mormon Critical Text Project, wherein the text of the two earliest manuscripts of the Book of Mormon is examined in an exhaustive textual study. These manuscripts are: 1) the “Original Manuscript,” which was the one actually transcribed by Oliver Cowdery (and a few others) as Joseph Smith dictated the translation. This manuscript is only about 30% still in existence, the rest having been damaged in storage. 2) The “Printer’s Manuscript,” which is a copy of the Original Manuscript made by Oliver Cowdery for the use of the printer E.B. Grandin. The entire Printer’s Manuscript is fortunately still extant. Through analysis of these texts, Skousen and his team have been able to establish that the Original Manuscript of the Book of Mormon was definitely transcribed from verbal dictation just as was claimed, and that Joseph Smith was viewing words in English through the seers stones. By looking at errors in the Original Manuscript, in which words were crossed out and rewritten with others words that sounded phonetically similar, it can be established that a person was listening to another speak as they were writing, and had to make corrections upon mishearing what was said. Examples of this type are so numerous that it leaves little room for doubt (see Royal Skousen, Book of Mormon Authorship Revisited: Evidence for Ancient Origins, Noel B. Reynolds, ed., p. 67-71). This analysis has also established that Joseph Smith was viewing at least 20-30 words at once (ibid., p. 71-75), and that Joseph Smith could see precisely how names were spelled (ibid., p. 75-82). It also establishes that the translation of the Book of Mormon from its original language was quite a literal translation, and not a loose rendering at all: “there is substantial evidence within the text itself for tight control over specific words, phrases, and sentences of English” (ibid., p. 87). The central idea in this small example was “the Nephites,” while the concepts that built up to it were “the Jews” and “the words” respectively. This of course is among the most simple of the appearances of chiasms in the Book of Mormon. As it turns out, the entire 36th chapter of Alma is one large chiasmus. As author Diane Wirth observes, “Chiasms appear throughout the Book of Mormon, but they appear most frequently in the first half of the book; the years closest to the time this group departed from Jerusalem” (Diane E. Wirth, A Challenge to the Critics: Scholarly Evidences of the Book of Mormon, p. 95). The question remains: Did Joseph Smith consciously implant a little-known Hebrew poetic form into his fictitious scripture, in hopes that maybe down the road scholars would notice it and give some credence to his work being viewed as authentic? Did Joseph Smith accidentally place this complex Hebrew poetic form into the Book of Mormon by pure happenstance? Or is the Book of Mormon actually an authentic ancient writing with heavy Hebrew influences? Obviously, the latter is definitely the case, as the other alternatives are simply too ludicrous to consider. 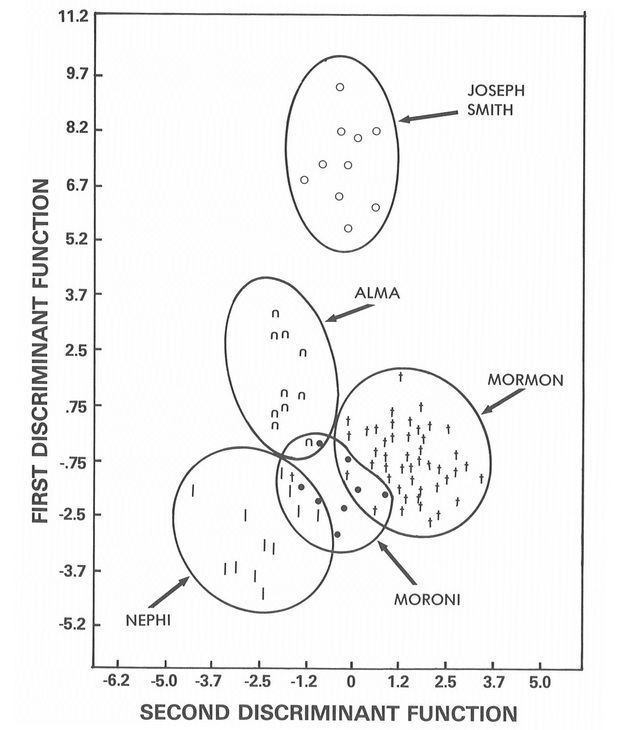 It is highly interesting that beginning in 1980 with researchers Wayne A. Larsen, Alvin C. Rencher, and Tim Layton, wordprint analysis has been performed on the Book of Mormon with startling results. 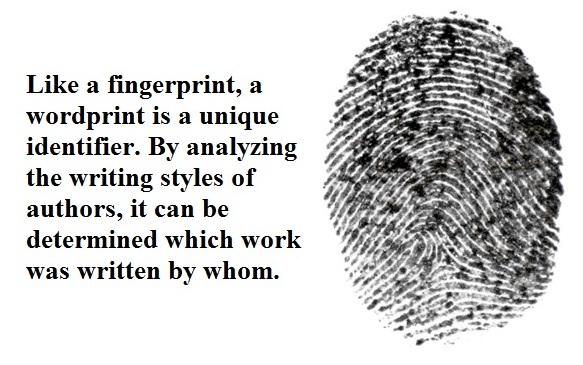 A wordprint, like a fingerprint, is very much a unique identifier based on writing style; just as each person has unique fingerprints, so they have unique writing styles or wordprints. This same methodology was used on the Federalist Papers (the essays written by the Founding Fathers to extol the merits of the Constitution) to determine which sections were written by James Madison or Alexander Hamilton. It has been established by extensive wordprint analysis of the Book of Mormon that more than twenty individual authors are responsible for the Book of Mormon, which is consistent with the claims of the Book that it contains the writings and discourses of multiple people. What is more, these authors do not match nineteenth century writing styles (Diane E. Wirth, A Challenge to the Critics: Scholarly Evidences of the Book of Mormon, p. 93). (Diane E. Wirth, A Challenge to the Critics: Scholarly Evidences of the Book of Mormon, p. 93). There was also a marked difference in writing styles between books in the Book of Mormon, such as from Enos to Jarom to Omni. Each author has been determined by expert analysis to contain a unique writing style (ibid., 94). This sort of detail is far too subtle to have been faked, for the untrained reader would probably never even notice any such differences, let alone Joseph Smith consciously attempting to incorporate differences in writing styles among his fictitious characters! from that of the authors in the Book of Mormon. Authorship: New Light on Ancient Origins, ed. Noel B. While the Book of Mormon may seem to be written rather awkwardly, even for nineteenth century English, it is nonetheless quite grammatically accurate to ancient Semitic languages. “John Tvedtnes, a scholar of the Hebrew language, points out that Book of Mormon expressions which are ungrammatical in English are, in Hebrew, perfect grammar” (Diane E. Wirth, A Challenge to the Critics: Scholarly Evidences of the Book of Mormon, p. 98). This is especially true of the first edition of the Book of Mormon, which underwent several grammatical “corrections” to make it sound more like proper English – replacing “that” and “which” with “who” and “whom,” etc. (ibid., p. 99). (Hugh W. Nibley, Since Cumorah, p. 150). Royal Skousen also observed, “In fact, the occurrence of non-English Hebraisms such as the if-and construction strongly suggests that the text was tightly controlled [i.e. it is a very literal translation of the original language, rather than a loose interpretation], down to the level of the word at least” (Royal Skousen, Book of Mormon Authorship Revisited: Evidence for Ancient Origins, Noel B. Reynolds, ed., p. 90). If the Book of Mormon were a fraud written by Joseph Smith or with the help of contemporaries, it is very doubtful that these nineteenth century men would have the inclination, foresight, or expertise to construct the Book of Mormon in such a way that it would appear in very close detail that it was in fact a strict translation from an ancient Near Eastern language. It is apparent that reformed Egyptian was not a form of Hieroglyphics, like is popularly thought. Egyptian hieroglyphics is a very cumbersome form of writing that requires a large amount of space. However, a later form of Egyptian writing, called demotic Egyptian, resembles Hebrew quite closely and was sort of a form of shorthand writing (Diane E. Wirth, A Challenge to the Critics: Scholarly Evidences of the Book of Mormon, p. 87). This demotic form of Egyptian was in wide use around 600 B.C., the time in which Lehi’s family left Jerusalem (ibid.). It would almost certainly be the case that reformed Egyptian would have been similar in nature to demotic Egyptian. As Nephi said, he had been taught in “the learning of the Jews and the language of the Egyptians” (1 Ne. 1:2). It is also interesting to here note that in the ancient Americas it was not unheard of for a priestly class to have its own written language quite apart from the common language of the people (Diane E. Wirth, A Challenge to the Critics: Scholarly Evidences of the Book of Mormon, p. 85). As Mormon wrote, “none other people knoweth our language” (Mormon 9:34). Therefore, we should not expect to see examples of reformed Egyptian in the ruins of Mesoamerica, since this form of writing was quite particular to the record-keeping involved with the plates. To the left appears the “Anthon Transcript,” or “the characters which I [Joseph Smith] had drawn off the plates” (JS-H 1:63) for Martin Harris to take with him to the professional scholars of the day. It is an important manuscript, for it shows a sampling of the actual writing found on the gold plates. 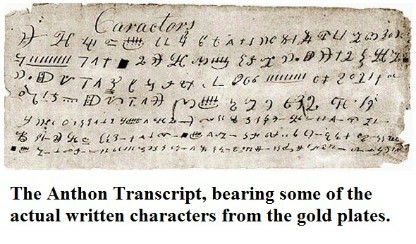 While critics delight in mocking the Anthon Transcript as Joseph Smith’s fraudulent attempt to fabricate ancient characters, it is very interesting that “Two roller clay stamps from early cultures in Mexico bear inscriptions with characters similar to the characters from the Anthon Transcript drawn from a plate of the Book of Mormon” (Diane E. Wirth, A Challenge to the Critics: Scholarly Evidences of the Book of Mormon, p. 84). (Hugh W. Nibley, An Approach to the Book of Mormon, p. 46). (Hugh W. Nibley, Since Cumorah, p. 171). (Hugh W. Nibley, Since Cumorah, p. 170-171). (Hugh W. Nibley, Since Cumorah, p. 169). The name Alma in the Book of Mormon has undergone some criticism, with objectors considering it to be a Latin name, not a Near Eastern name, and a woman’s name at that. However, there is evidence in Palestine for the name Alma having been in use as a man’s name. Daniel C. Peterson reports, “During the second Jewish revolt against Rome, the leader of that revolt, Shimeon Bar-Kokhba (or Bar Kosiba), had nationalized some of the real estate around the northwestern shores of the Dead Sea.” Found in this area was “a land deed bearing the names of four people who had leased nationalized property under Bar-Kokhba” and, “one of those four was ‘Alma, son of Yehudah’” (Daniel C. Peterson, Book of Mormon Authorship Revisited: Evidence for Ancient Origins, Noel B. Reynolds, ed., p. 146). Of course, this discovery regarding the male Israelite use of the name Alma was made since the coming forth of the Book of Mormon. (Diane E. Wirth, A Challenge to the Critics: Scholarly Evidences of the Book of Mormon, p. 110-111). Some cautions about the nature of archeological evidence are prudent before we continue onward. Archeology, like any science, is in constant flux and constantly assimilating new information, and often views that were once widely held are abruptly overturned. Therefore, it is not prudent to base our testimony of the Book of Mormon solely or even largely on the basis of archeology. While it can be a powerful instrument for study and a testimony builder, archeology by its nature is a bit of a sandy foundation which shifts here or there with new information. It is not the author’s intention to try to prove the Book of Mormon true through archeology, but rather it is his intention to demonstrate plausible connections between the ancient world and the Book of Mormon as established through archeology. As for a genuine testimony of the Book of Mormon, this is gained only by reading the sacred Book, honestly considering its message, and receiving from God a spiritual witness of its truth. While ideas and paradigms of archeology may shift over time, the truth of the Book of Mormon stands forever, independent of theories or popular notions of the ancient world. 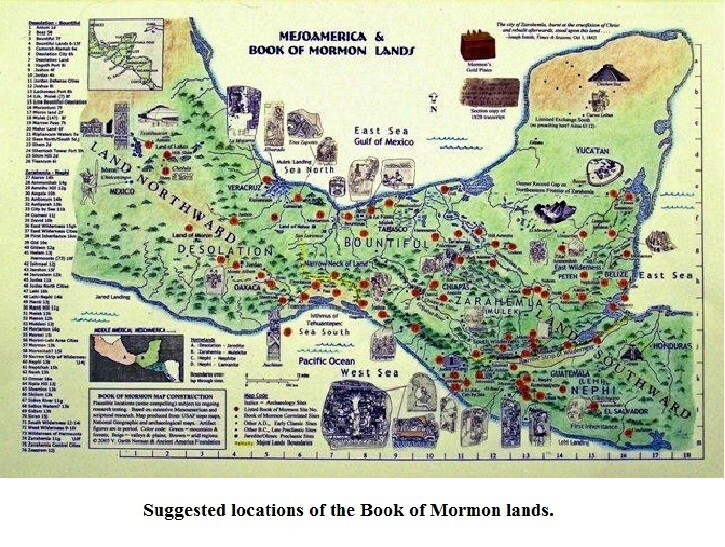 Note to the Reader: Since this article was written, I have sinced become intrigued by the convincing evidences of the Heartland Theory as espoused by Rod L. Meldrum at bookofmormonevidence.org. However, I have not had sufficient time or ability to update this portion of the article. I encourage the reader to consider Rod’s message on his website. (As quoted in History of the Church 6:53). From this it appears quite evident that the Book of Mormon lands are the lands of Central America where the great ancient civilizations of the ancient Americas rose and flourished. 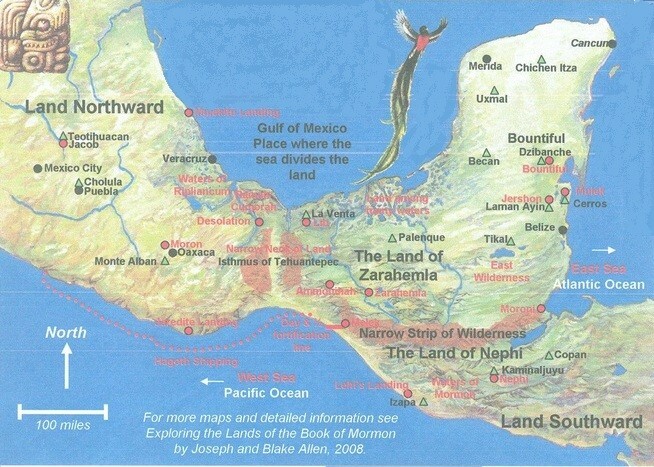 It just so happens that this area of Central America, which has been identified as the Book of Mormon lands, is the place where evidence for the Book of Mormon abounds. We will now discuss many of the archaeological evidences of the Book of Mormon. each side of the river as far as our vision could extend, and the scenery was truly delightful. (Joseph Smith, History of the Church, 2:79-80). While many take from this experience that it suggests a hemispheric scope of the Book of Mormon geography, which it certainly seems to, this may not be the case. First of all, it seems very apparent that all of the Book of Mormon “puzzle pieces” so to speak seem to fit in Mesoamerica, not the northern United States. What are we to make of this story of Zelph? It is more likely that some Nephites had travelled northward to escape the slaughter in the south (i.e. in Mesoamerica), rather than all of Book of Mormon history occurring there. As the Prophet Joseph Smith taught, the remains of Zelph, the white Lamanite, were a remnant of “the last great struggle of the Lamanites and Nephites” (ibid), indicating that as the days of the Nephites were numbered, they may have scattered northward in a vain attempt to preserve their lives. Perhaps Zelph was a travelling companion of Moroni for a time, who no doubt made his journey from Mesoamerica to upstate New York. We do know that Moroni passed through what is now southern Utah on his way northward, as President Brigham Young confirmed that Moroni had anciently dedicated the site on which the Manti temple is currently standing (see Orson F. Whitney, Life of Heber C. Kimball, p. 436). This would indicate that Moroni indeed did travel from Mesoamerica, which is virtually straight southward of southern Utah, in his journey toward the area of New York state. Otherwise, if all of the Book of Mormon events happened around New York state, then it would seem Manti, Utah would be quite a long way out of Moroni’s way to travel simply to dedicate the Manti Temple grounds. 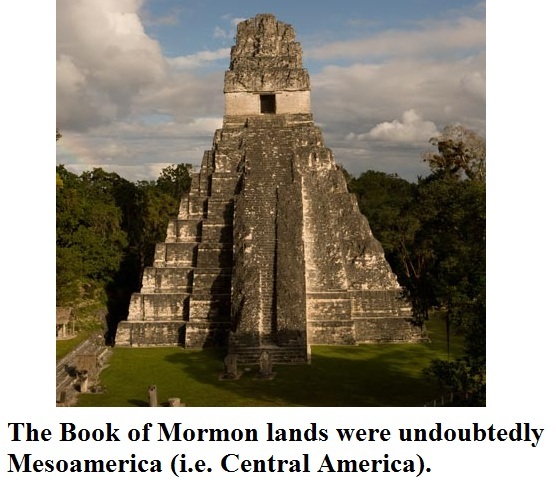 At any rate, placing the Book of Mormon geography within the limits of Mesoamerica requires that there are two hill Cumorahs, the one in Mesoamerica in which both the Jaredite and Nephite civilizations met their end (Ether 15:11-34; Morm. 6:11), and the one in upstate New York where Moroni eventually deposited the plates in proximity to where Joseph Smith was destined to be. It would make perfect sense, however, to call the second hill after the original hill Cumorah, since it was also a place where sacred records were deposited, but not the records from which the Book of Mormon was translated. As Mormon said, “I made this record out of the plates of Nephi, and hid up in the hill Cumorah [i.e. in Mesoamerica] all the records which had been entrusted to me by the hand of the Lord, save it were these few plates which I gave unto my son Moroni [i.e. the plates from which the Book of Mormon was translated]” (Morm. 6:6, emphasis added). Also, if the hill Cumorah referred to in this passage were the same as the one in New York, and Moroni was depositing them in the same hill as Mormon’s records, why place the Book of Mormon plates in its own location in a stone box and not place it in the readily made hiding place with the other records which Mormon had? While the locations of events surrounding the Book of Mormon after Lehi’s party reached the Western Hemisphere are quite ambiguous, this is not the case relative to Lehi’s journey into the wilderness. 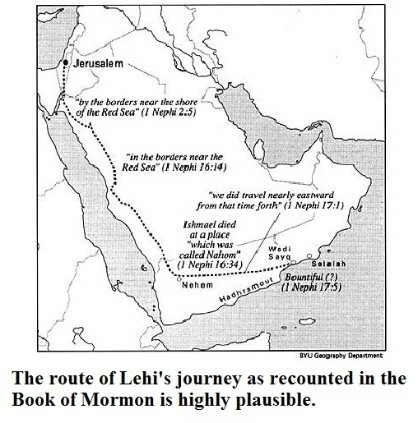 Since we know the starting point of Lehi’s party – the city of Jerusalem – and we have the directions of their travels, we can actually test the information presented in the Book of Mormon, to see if what it describes about Lehi’s journey was actually plausible or not. (Noel B. Reynolds, Book of Mormon Authorship Revisited: Evidence for Ancient Origins, Noel B. Reynolds, ed., p. 379). Scholars have now located the probable sites of Nahom, the burial site of Ishmael (1 Ne. 16:34. 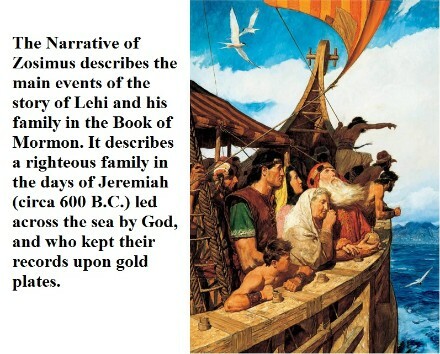 Nahom is indicative of the Hebrew word for “consolation”), and the land of Bountiful where Lehi’s family resided and built a ship to cross the sea. Apparently nomads of Arabia often named the places which they spent significant time in, just as Lehi’s family had done (ibid., p. 380). The ancient site of Nehem in Yemen was a burial ground in ancient times, and this place of burial is the probable site for the Nahom of the Book of Mormon (ibid., p. 381). Lehi’s family then followed a well-travelled trade route, which “followed water holes through inland valleys that paralleled the east shore of the Red Sea” (ibid.). From there, Lehi’s family was led to a fertile area: “And we did come to the land which we called Bountiful, because of its much fruit and also wild honey…. And it came to pass that we did pitch our tents by the seashore” (1 Ne. 17:5-6). Bountiful also had sufficient timber in the area to build a ship of a fair size (see 1 Ne. 18:1) and ore for making tools (see 1 Ne. 17:9-10). This location also had a mountain in which Nephi went up to pray (1 Ne. 17:7), a treacherous cliff or prominence which Laman and Lemuel nearly cast Nephi over into the sea (1 Ne. 17:48), and it needed to be “nearly eastward” from the site of Nehem/Nahom (1 Ne. 17:1). Researchers have “discovered an obscure site, little known to the people even of [the nation of] Oman, that seems to easily and convincingly meet all the criteria for Bountiful” (Noel B. Reynolds, Book of Mormon Authorship Revisited: Evidence for Ancient Origins, Noel B. Reynolds, ed., p. 383). The name of this site in Oman is Khor Karfot (ibid., p. 384). 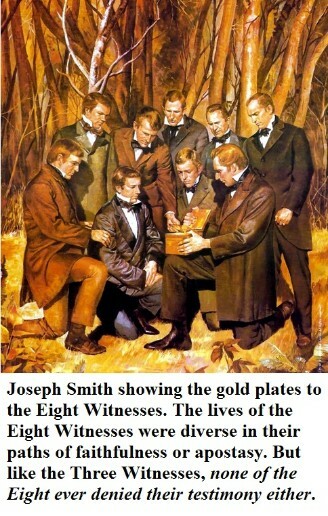 When the story of Joseph Smith’s obtaining the gold plates which would become the Book of Mormon began to circulate, it caused a great deal of excitement. For a long time the idea of such a record – an account written upon gold plates and stored in a box made of stone – was a much-ridiculed facet of the Joseph Smith story, and was seen by critics as a silly piece of Joseph Smith’s fertile imagination. Who ever heard of a record being kept on gold plates! As Hugh Nibley noted, “it is only too easy to forget that nothing in the coming forth of the Book of Mormon excited louder howls of derision than the fantastic idea of a sacred history being written on gold plates and then buried in the ground” (Hugh W. Nibley, Since Cumorah, p. 57). However, interesting evidence has arisen since the coming forth of the Book of Mormon that proves that the ancients did just that. 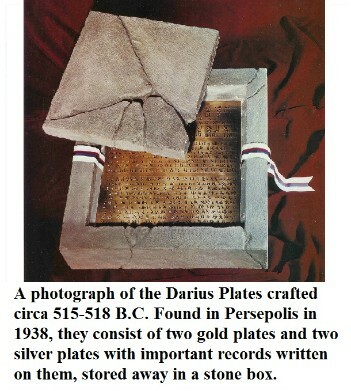 In 1938 an amazing discovery was made: plates of Darius I, ruler of Persia from 515-518 B.C. (very close in time to the time when Lehi left Jerusalem in 600 B.C.) were discovered in Darius’ palace at Persepolis. The find consisted of four metal plates, two gold and two silver, covered in writing, and found sealed in a stone box (Diane E. Wirth, A Challenge to the Critics: Scholarly Evidences of the Book of Mormon, p. 38-39). The parallel to the way Joseph Smith claimed the Book of Mormon to have been deposited is nothing short of startling. The message of the plates of Darius was an important one – at least for Darius – as they proclaimed for all time and future generations the majesty of the Persian Empire. Only very important records were preserved in this manner. Another interesting find was discovered in 1965 in Korea and are called the Korean Plates. These nineteen plates of gold are covered in writing and “hinged and folded on top of each other” much like a book, and stored in a bronze box (ibid., 39). 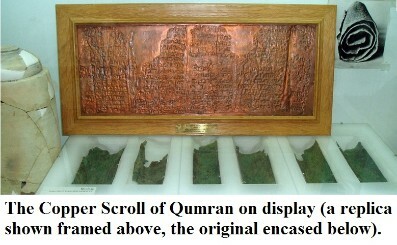 As it turns out, the Essenes in Qumran, the Jews responsible for the famed Dead Sea Scrolls discovered in 1947, also wrote upon plates of metal, which writing has come to be known as “the Copper Scroll.” In reference to this amazing archaeological find, Hugh Nibley wrote, “It is a document of first importance: ‘There is hardly an aspect of Near Eastern Archaeology, history, and religion that it does not in some way illumine.’ Originally it consisted of copper plates, but these have been riveted together so that they could be rolled up in imitation of a sacred leather scroll. Why copper? Because this record was more valuable than any of the other Scrolls, being nothing less than a catalog of all the buried treasures of the society” (Hugh W. Nibley, Since Cumorah, p. 55). Like the Book of Mormon, the Dead Sea Scrolls were also hidden away because of what the inhabitants of Qumran considered the wickedness of men, to come forth at a future time. Metalworking, particularly with gold, was a prominent skill for the Indians of Central America, and was apparently even known among other Indians. The Ispogogee Indians of Alabama were said to have “many brass and copper plates containing prophetic writings of their forefathers which were given to them by the same deity they say we call God” (Diane E. Wirth, A Challenge to the Critics: Scholarly Evidences of the Book of Mormon, p. 43). Authors Hyatt and Ruth Verrill recorded that, “According to traditions a complete history of the Maya was recorded in the Golden Book of the Mayas which, if it actually existed, as it probably did, was so carefully hidden to prevent it from falling into the hands of the Spaniards that it never has been found” (as quoted in ibid.). As far as stone boxes are concerned, this was a common spectacle in Mesoamerica. As Diane Wirth noted, “Joseph Smith was not only unaware of the use of metal plates in the Old World, but he could not have known that, after his death, more than fifty stone boxes would be found in Mesoamerica where much of the Book of Mormon story took place” (ibid.). Within the Book of Mormon is found the history of two peoples: the white-skinned Nephites and the dark-skinned Lamanites, of whom the American Indians are descended (see D&C 28:8; 32:2; 54:8). The Nephites “were white, and exceedingly fair and delightsome,” while as for their contemporaries the Lamanites, “the Lord God did cause a skin of blackness to come upon them” (2 Ne. 5:21). Throughout the history of the Book of Mormon these two peoples warred with eachother, and eventually the Lamanites succeeded in utterly destroying the light-skinned Nephites, so that when Columbus arrived at the New World, there was not a white man left on the continent for a thousand years. In light of this basic fundamental of the Book of Mormon – the existence of a fair-skinned race on the American continent – it would be extremely significant to find evidence of the existence of just such a race in the Americas. Therefore another discovery in Central America that is no less than absolutely sensational is found at the ruins of Chichen Itza in the Yucatan peninsula of Mexico. 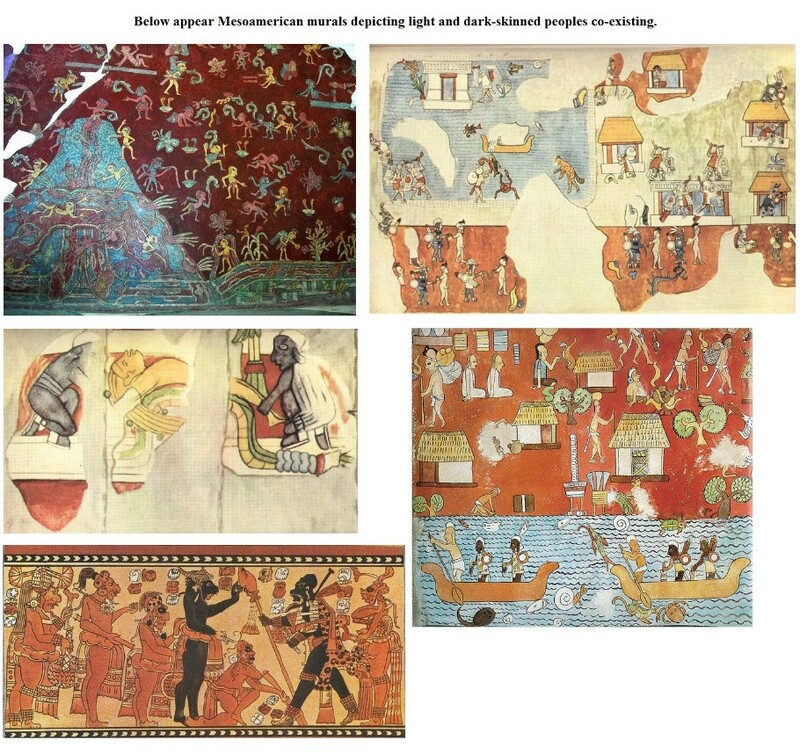 At that site, within what is called the “Temple of the Warriors,” are fascinating murals depicting interactions between light and dark-skinned peoples! Another such mural depicting light and dark-skinned people is found at Tepantitla, a site within Teotihuacan at present day Mexico City, Mexico. Those who oppose the Book of Mormon almost universally maintain that there was only one color of people inhabiting the land – dark-skinned American Indians. Then how do we explain these amazing murals of antiquity, depicting the events of history? (Diane E. Wirth, A Challenge to the Critics: Scholarly Evidences of the Book of Mormon, p. 58-29). 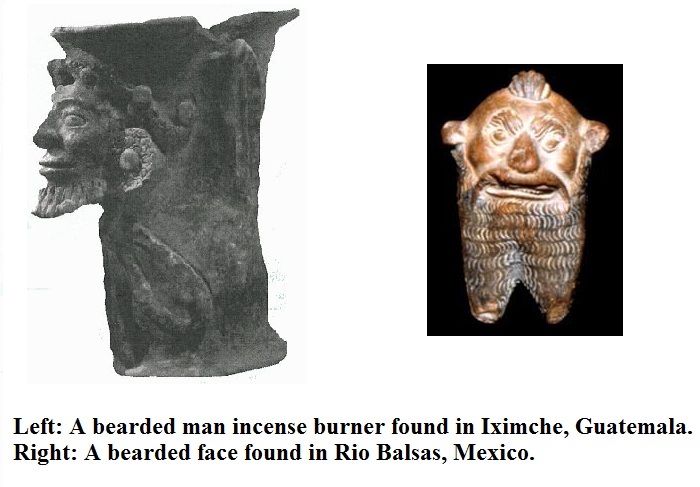 Apparently among pre-Columbian Indians, fake decorative beards were worn as a symbol of great status (ibid.). It seems that the Lamanites’ descendents honored the beards found on their Nephite contemporaries, or indeed were perhaps envious of them, as they sought to imitate them in this way. And perhaps the beard of Jesus Christ (see 2 Ne. 7:6; Isa. 50:6), to be discussed more later, created in their minds a sense of nobility surrounding beards. (Bancroft as quoted in Diane E. Wirth, A Challenge to the Critics: Scholarly Evidences of the Book of Mormon, p. 142). which remained; but the damage thereof was exceedingly great, and there were many in them who were slain. Naturally, because the topography of the earth was changed so drastically, and it has been so many years since these events (and since the jungle growth of Mesoamerica makes archaeological finds notoriously hard to locate), and the fact that many of the cities were later rebuilt (see 4 Ne. 1:7-8), we should not expect to find too many examples of these destroyed cities. However, the scriptural record does mention that, “But there were many cities which had been sunk, and waters came up in the stead thereof; therefore these cities could not be renewed” (4 Ne. 1:9). One such example of these is the city of Samabaj in Guatemala (“The Submergence of the City of Jerusalem in the Land of Nephi,” John L. Sorenson, Insights, Vol. 22, Issue 4. Provo, Utah: Maxwell Institute). 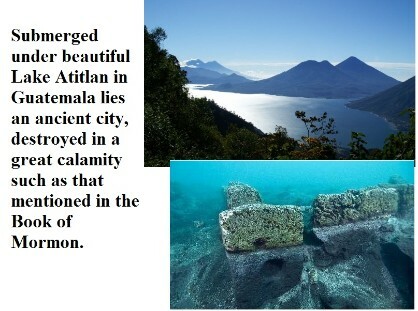 The city of Samabaj is completely underwater, buried in a lake of all things, Lake Atitlan to be exact, some 2,000 years ago, which is precisely in the range of time in which the Book of Mormon destructions occurred. As the Book of Mormon chronicled, “And many great and notable cities were sunk” (3 Ne. 8:14). No doubt that this one find at the bottom of beautiful Lake Atitlan is representative of several others not yet found. In the time of Joseph Smith, it was commonly thought that American Indians across the continent never had a very advanced civilization or much in the way of great accomplishments. 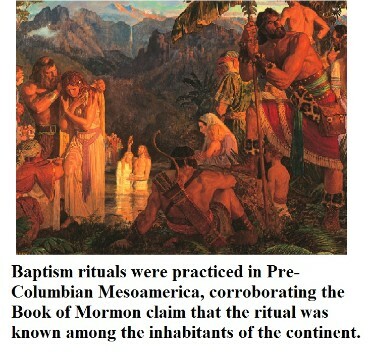 Yet in the Book of Mormon are included references to great structures built in the Americas prior to Columbus. Regarding the road system of the Nephites, the Book of Mormon describes, “And there were many highways cast up, and many roads made, which led from city to city, and from land to land, and from place to place” (3 Ne. 6:8). 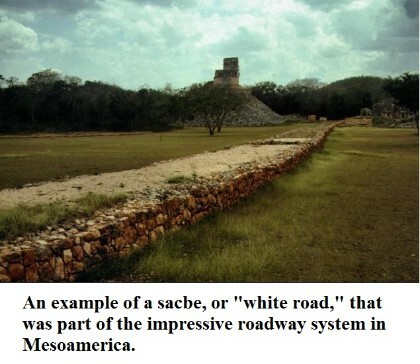 This is very interesting because Mesoamerican civilizations built impressive highway systems that rivaled that of the Romans. Daniel C. Peterson commented, “‘Highways’ and ‘roads’ are mentioned as used by the Nephites (3 Ne. 6:8). Some Latter-day Saints consider these to be reflected in the extensively documented road systems of ancient Mexico” (Daniel C. Peterson, To All the World: The Book of Mormon Articles from the Encyclopedia of Mormonism, Provo, Utah: Maxwell Institute, http://maxwellinstitute.byu.edu/publications/books/?bookid=51&chapid=366 retrieved Jan. 2, 2012). “The Spaniards who saw [the famous Inca roads] during the conquest declared them to be greater than the famous Roman roads, for each of the main highways was more than 2,000 miles in length and from 15 to 25 feet wide” (History and Culture of the Incas (Lima, 1960), p. 20). (Hugh W. Nibley, Since Cumorah, p. 221). In the time of Joseph Smith, it was thought that Native Americans across the Americas never had a very advanced understanding of astronomy. Yet the Book of Mormon gives very frank admissions regarding the astronomical knowledge of the Nephites. As Alma taught, “all things denote there is a God; yea, even the earth, and all things that are upon the face of it, yea, and its motion, yea, and also all the planets which move in their regular form” (Alma 30:44), suggesting that the concept of planets was common knowledge among the people. The prophet Mormon mentioned that, “Yea, if [God] say unto the earth—Thou shalt go back, that it lengthen out the day for many hours—it is done; And thus, according to his word the earth goeth back, and it appeareth unto man that the sun standeth still; yea, and behold, this is so; for surely it is the earth that moveth and not the sun” (Hel. 12:14-15). 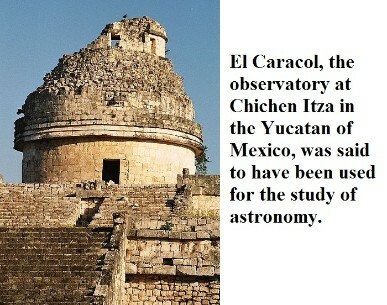 It is very interesting that the Mesoamericans were indeed avid astronomers, as evidenced by the existence of El Caracol, the Observatory of Chichen Itza in the Yucatan of Mexico. In fact, they were able to develop highly accurate calendars based on their knowledge of astronomy and the cosmos. “[The Maya priest-astronomers]...plotted the courses of the planets, including dim and elusive Mercury. So accurate were the measurements of those ancient Maya astronomers, that they differ only slightly in degrees and minutes from those of our present-day astronomers aided by powerful telescopes and advanced mathematical formulas.... The old Mayan astronomers didn’t stop with their observations of the movements of the sun, the moon, and the known planets, but compiled tables of lunar eclipses and predicted these with astounding accuracy” (Yucatan - The Land of the Maya, (Mexico D.F., 1953) p. 12-13). It is also apparent that this was not a late development, but a feature in Mesoamerican civilization during Book of Mormon times: “The Maya had an amazingly accurate calendar, a triumph of mathematical genius, and had developed a system for recording time by hieroglpyhics that was so perfect at the beginning of the Christian era that its origin must be sought in a much earlier period” (Pal Kelemen, Medieval American Art, 1956, p. 17). “Ixtlilxochitl, a sixteenth-century historian, native of Mexico and of royal lineage, wrote that three groups of people came from across the ocean to populate Mesoamerica. In his writings, the first group is referred to as the ‘Ancient Ones’ and they are described as giants, or ‘men of large stature.’ The account of Ixtlilxochitl is important in light of what the Book of Ether states regarding the physique of these people. The brother of Jared, spiritual leader of these people, is referred to as ‘being a large and mighty man.’ This may not have been mentioned if he had not been exceptionally so. (Diane E. Wirth, A Challenge to the Critics: Scholarly Evidences of the Book of Mormon, p. 102-103). Legends of antiquity from ancient America match up amazingly well with the Jaredite story, which originates with the Tower of Babel of the Bible. The legends of these ancient ones claim that they “were extremely large in size” and “Desiring to reach the sun, they…. decided to build a tower so high that its summit would reach unto Heaven.” After the confusion of their language, these people then fled the area in all directions. (Diane E. Wirth, A Challenge to the Critics: Scholarly Evidences of the Book of Mormon, p. 103). Another interesting facet of the Olmec civilization that makes sense in the context of the Jaredites in the Book of Mormon is its apparent sudden appearance as a fully-flowered civilization. “An unexplained aspect of the Olmec society is the way it arrived on the scene in early times with an integrated culture. The ‘Ancient Ones’ appear to have skipped the usual developmental stages between food-gathering and organized life and to have arrived out of nowhere in a state of full development” (ibid., p. 106). (Diane E. Wirth, A Challenge to the Critics: Scholarly Evidences of the Book of Mormon, p. 103). The Book of Mormon describes the presence of steel among the Jaredite civilization, which had been isolated on the American continent since circa 2200 B.C. to 600 B.C., particularly with reference to swords (see Ether 7:9). Critics say steel did not exist that early in history and that its presence among the Jaredite civilization is a historical anachronism. The Nephite civilization also makes numerous reference to swords, and a few mentions of steel, though not with reference to the making of swords (see 2 Ne. 5:15; Jarom 1:8), with the apparent exception that Nephi “did take the sword of Laban, and after the manner of it did make many swords” (2 Ne. 5:14). Critics also point out that Mesoamerican civilizations have not been found to have used metal swords. How are these things to be reconciled? It seems apparent that our preconceived notions of what a “sword” is may be a bit of a stumbling block in understanding the Nephite/Lamanite weaponry. The “swords” used by the Nephites and Lamanites may have been more along the lines of the American Indian macana or macuahuitl, which basically was a wooden sword studded with sharp obsidian stones above the hilt. This weapon was used for slashing rather than clubbing, just as a conventional sword would be. The Spanish conquistadors considered the weapon to be quite fearsome and the equivalent of their swords, and in fact that is what they called them: espada, Spanish for “sword” (Matthew Roper, “Swords & ‘Cimeters’ in the Book of Mormon,” Journal of Book of Mormon Studies, Vol. 8, #1, 1999, p. 36). One of the most contentious issues regarding Book of Mormon accuracy is its claim to the existence of horses in pre-Columbian America. The Book of Mormon indicates that horses existed commonly both in the Jaredite and then also the Nephite/Lamanite civilizations, covering a span of some 2,600 years (see Alma 18:9; Ether 9:19). In contrast to this, popular opinion is that there were no horses in America prior to its discovery by Columbus. 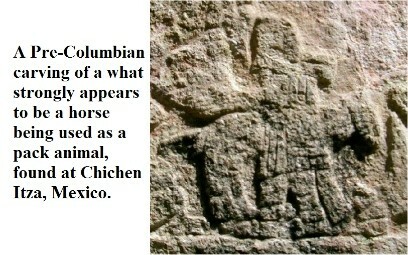 It is interesting that the horse is depicted in Mesoamerican art as a beast of burden used by man. In Chichen Itza within the Yucatan Peninsula of Mexico is found “a bas-relief of a bearded man…who stands alongside what appears to be a horse” (Diane E. Wirth, A Challenge to the Critics: Scholarly Evidences of the Book of Mormon, p. 52). In addition to this, “In the more unexplored regions of the North States of Amazonia in Brazil, Professor Marcel Homet investigated some interesting petroglyphs at the Pedra de Beliquevem – petroglyphs that portray horses with and without riders, and some burdened with baskets” (ibid., p. 53). In addition to this, “many of the inscriptions at this and other nearby sites have been determined by scholars to be composed of ancient Mediterranean characters” (ibid.). Why did the horse become extinct in ancient America by the time Columbus arrived? Interestingly, they may have been hunted to extinction for food. “Researchers have determined that the ancient horse was hunted and eaten by early natives of South America. In fact, horse meat is still eaten in Mexico today. In addition, historians have noted that in times of war and famine, the horse was used primarily as a source of food rather than a means of transportation” (Diane E. Wirth, A Challenge to the Critics: Scholarly Evidences of the Book of Mormon, p. 55). This coincides with the Book of Mormon’s mention that in a time of emergency the Nephites “reserved for themselves provisions, and horses and cattle, and flocks of every kind, that they might subsist for the space of seven years” (3 Ne. 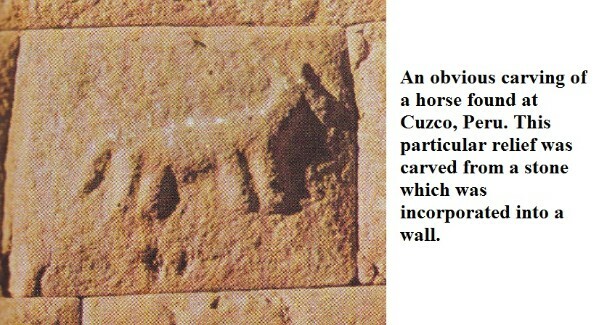 4:4), suggesting that the horses were to be used for food. Also among the list of strange animals claimed to be found anciently in America by the Book of Mormon are elephants. Mention of these great beasts is made with reference to the earlier civilization of the Book of Mormon, the Jaredites, who lived on the continent circa 2200 B.C. to 600 B.C. Of the Jaredite civilization, the Book of Mormon record mentions, “And they also had horses, and asses, and there were elephants and cureloms and cumoms; all of which were useful unto man, and more especially the elephants and cureloms and cumoms” (Ether 9:19). The identity of cureloms and cumoms remains a mystery. Apparently they were indigenous animals to the land of the Book of Mormon peoples but there was no satisfactory English translation for these animals in common usage at the time the Book was translated, and so the words were left untranslated. However, the identity of elephants seems quite obvious. We are all familiar with elephants and know what they are. It is also common knowledge that elephants do not inhabit the Americas today, hence why their mention in the Book of Mormon has been both surprising and troubling for many. to the elephants? The Jaredites used them, we are told, but there is no mention of the Nephites having them. (Hugh W. Nibley, Since Cumorah, p. 225-226). In addition to this there also exists in Mesoamerican architecture many clear resemblances of elephants. 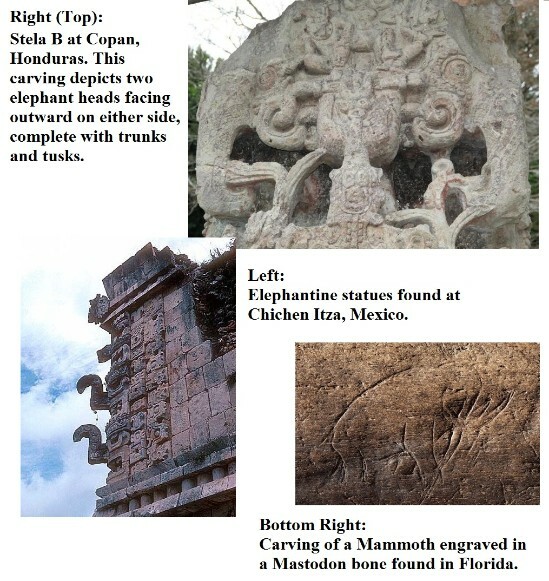 Now, if elephants did not exist in the Americas, why do we find architecture with elephants, complete with long trunks and large ears, on display amidst the ruins of Mesoamerica? Another thing to keep in mind regarding this issue is the evidence for ancient mastodons (i.e. woolly mammoths) that co-existed with humans in the Americas (see Diane E. Wirth, A Challenge to the Critics: Scholarly Evidences of the Book of Mormon, p. 51). Scientists would try to tell us that the mammoths lived in the Americas some ten or fifteen thousand years ago, long before the Jaredites would have arrived on the continent. Of course, these dates, like those of many other ancient specimens, are quite unreliable and impossible to verify with complete confidence. In addition, we have it from the word of the Lord that the earth is only about 6,000 years old since it fell from its paradisiacal existence (see D&C 77:6-7). Therefore, mammoths could not have been roaming America and being hunted by humans 15,000 years ago, for the earth was not yet in such a condition. Therefore, the specimens of mammoths must fit within a much more condensed time-frame, therefore making their co-existence with the Jaredite nation quite likely. (Daniel C. Peterson, To All the World: The Book of Mormon Articles from the Encyclopedia of Mormonism. Regarding the use of wheels, Diane Wirth wrote, “Although the wheel was not in use in Mesoamerica when the Spanish arrived, ancient Americans obviously had knowledge of it. 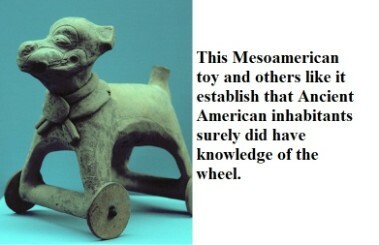 Although it was apparently used for decorative rather then [sic] utilitarian purposes, the wheel was still a part of Mesoamerican culture” (Diane E. Wirth, A Challenge to the Critics: Scholarly Evidences of the Book of Mormon, p. 58). She also wrote, “Mesoamericans most certainly had knowledge of the wheel…. In 1973, Stanley Boggs stated that sixty examples of wheeled objects had been found. Many more have been found since that publication appeared” (ibid., p. 59). Izapa Stela 5 – Lehi’s Dream? 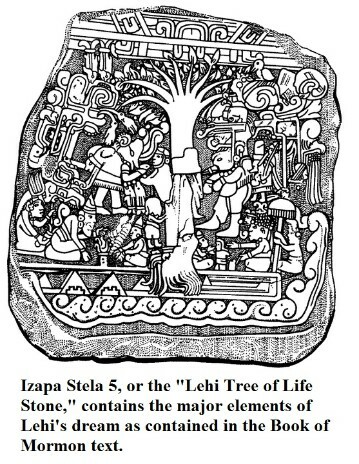 Another interesting Mesoamerican artifact that is possible evidence for the Book of Mormon is an ancient carved stone now known as Izapa Stela 5, also colloquially known as the “Lehi Tree of Life Stone.” This stone has carved on it images that are strongly reminiscent of Lehi’s Dream in the Book of Mormon (see 1 Ne. 8). This dream of Lehi, which was a grand revelatory vision, is among the most notable instances in the Book of Mormon text. Therefore, it would not be altogether surprising if we were to find this story memorialized in stone by the Book of Mormon people or their descendents. Discovered in 1939 in Chiapas, Mexico, the find was largely ignored until about a decade later an LDS archeologist named M. Wells Jakeman noticed its astonishing similarity to the story of Lehi’s Dream in the Book of Mormon. On the stone are found several elements that are integral to Lehi’s Dream, including the obvious tree which is the center of the image (see 1 Ne. 8:9-11), the river of water beneath the images (see 1 Ne. 8:13), a “rod of iron” (see 1 Ne. 8:19-20), and several people from that Book of Mormon story. On the stone is carved the image of an elderly bearded man who appears to be in the attitude of lecturing or teaching. Above this man is a glyph of a crocodile’s upper jaw which serves to identify the old bearded man. This is significant since the name “Lehi” means “jawbone” (see Judges 15:9, 15). Apparently “the sign of a crocodilian upper jaw…was a major sign used to designate one who was a diviner, or prophet” (Diane E. Wirth, A Challenge to the Critics: Scholarly Evidences of the Book of Mormon, p. 71). To the rear of the Lehi image is a woman, presumably Sariah, Lehi’s wife. There are also two figures with their backs to the tree, which is reminiscent of Lehi’s sons Laman and Lemuel, who rejected the fruit in Lehi’s Dream (see 1 Ne. 8:17-18). Also on the stone is a character strongly suggestive of Nephi, as he is holding a writing instrument. “To the right of the tree a man holding a stylus is seen. He is represented as listening to the narrative of the old man and prepared to make a record of the account. A plate, or tablet, can be seen directly under the stylus” (Diane E. Wirth, A Challenge to the Critics: Scholarly Evidences of the Book of Mormon, p. 72). Many today scoff at the notion of Hebrews in ancient America. However, there is interesting evidence uncovered by researchers from the Smithsonian Institute that Hebrews were in fact in the Americas. Discovered in Tennessee in 1889 and unearthed from an Indian mound, initially the find had no connection to Hebrew language or culture. In fact, in the official research report of this “Bat Creek Stone,” its image was actually printed upside down unwittingly and it was mistaken for the Cherokee language. Then much later in the 1960s, a notable scholar of ancient languages name Cyrus H. Gordon determined that, when turned right side up, the Bat Creek Stone has written on it in the Hebrew language, “For the Land of Judah” (Diane E. Wirth, A Challenge to the Critics: Scholarly Evidences of the Book of Mormon, p. 79-80). This is an indication that Hebrew culture existed in the Americas anciently. 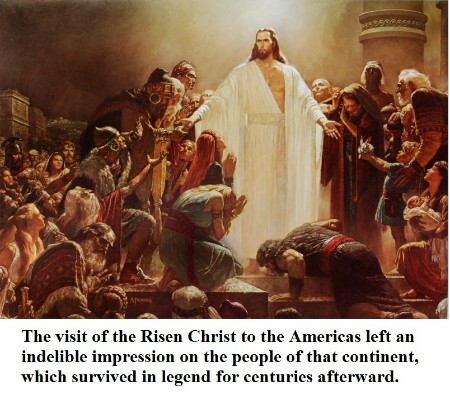 The Book of Mormon makes the claim of a spectacular and public visit of the Lord Jesus Christ to the American continent. There he taught the people publicly and had such a great effect upon them that all converted to Christianity and dwelt in a state of universal righteousness and peace for almost 200 years after His coming (4 Ne. 1:2, 20-22). If this Book of Mormon story were true, then surely there would be some sort of record, or legend, or remembrance of this great and profound event existing among the Indians of Central America. And in fact, there is. 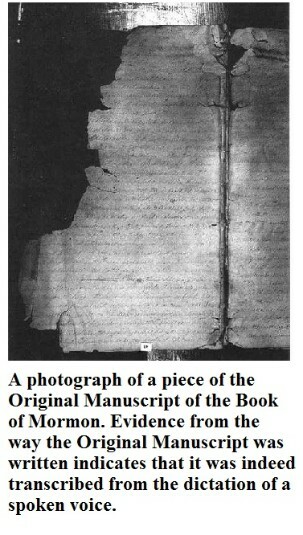 This is perhaps the strongest piece of archaeological evidence for the Book of Mormon in existence. (As quoted in Diane E. Wirth, A Challenge to the Critics: Scholarly Evidences of the Book of Mormon, p. 134). Quetzalcoatl worship was widely dispersed throughout Mesoamerica, and the deity was known variously as Kukulcan, Viracocha, and Itzamna, depending on the culture of Indians. Everywhere this legend occurred, however, the elements were the same. Quetzalcoatl/Kukulcan meant “feathered serpent,” suggesting a mixture of the earthly (the serpent) and the heavenly (the feathers of a Quetzal bird). “He was literally understood to be a man-god, as was Jesus Christ: son of an earthly mother and a heavenly father” (ibid., p. 136). A feathered serpent also figures in Egyptian lore, with the Book of the Dead asserting that “transformation into a serpent, implies wisdom and immortality and power of rebirth” (ibid., p. 138). The symbol of the serpent was used for Jesus Christ when Moses placed a brass serpent upon a pole in the Old Testament (Num. 21:8-9; see also Hel. 8:13-15), and for this reason the image of a serpent was portrayed on Solomon’s temple anciently (Diane E. Wirth, A Challenge to the Critics: Scholarly Evidences of the Book of Mormon, p. 138). No doubt this imagery carried through the Nephite culture of the Book of Mormon peoples. Critics of the Book of Mormon try to claim that the Quetzalcoatl legend is anachronistic to the Book of Mormon, claiming that it started much later around 1000 A.D. and was associated with a conqueror-king who called himself Kukulcan. However, this is misleading, since Kulkulcan took his name in honor and imitation of the Kulkulcan of legend, the bearded white god, which was certainly much earlier and very pervasive in the Indian cultures (Diane E. Wirth, A Challenge to the Critics: Scholarly Evidences of the Book of Mormon, p. 134-135). Quetzalcoatl was said to have created the earth and breathed the breath of life into people (“Quetzalcoatl, the Maya Maize God, and Jesus Christ,” Diane E. Wirth, Journal of Book of Mormon Studies: Volume - 11, Issue - 1, Pages: 4-15 Provo, Utah: Maxwell Institute, 2002). Quetzalcoatl was said to have supplied the Indians with maize bread, their most important staple (ibid.). This is reminiscent of Jesus’ pronouncement, “I am that bread of life” (John 6:48). Quetzalcoatl was white-skinned and bearded (Diane E. Wirth, A Challenge to the Critics: Scholarly Evidences of the Book of Mormon, p. 136). Quetzalcoatl was “strongly associated with baptism” (Diane E. Wirth, A Challenge to the Critics: Scholarly Evidences of the Book of Mormon, p. 142). Quetzalcoatl sacrificed himself for mankind when he “descended to the Underworld to shed his blood onto the bones of the deceased so that they would live again” (“Quetzalcoatl, the Maya Maize God, and Jesus Christ,” Diane E. Wirth, Journal of Book of Mormon Studies: Volume - 11, Issue - 1, Pages: 4-15 Provo, Utah: Maxwell Institute, 2002). This is reminiscent of Jesus’ ministry to the spirit world (D&C 138:11-19), His shed blood to atone for sin, and the resurrection made possible when He had risen Himself from the dead. “Associated with the life-giving sun… [Huitzilopochtli, a later conception of Quetzalcoatl] is a symbol of resurrection” and is “also associated with a ceremony which parallels the last supper, or passover” (Diane E. Wirth, A Challenge to the Critics: Scholarly Evidences of the Book of Mormon, p. 143). The revelations teach that Jesus Christ, or at least the light of Christ, “is in the sun, and the light of the sun, and the power thereof by which it was made” (D&C 88:7). It is also possible that the legends also claim that Quetzalcoatl was born of a virgin, and that he promised to return again. However, these legends may be more associated with a later famous ruler who took upon himself the title of Quetzalcoatl, and so the connection with these points is inconclusive (“Quetzalcoatl, the Maya Maize God, and Jesus Christ,” Diane E. Wirth, Journal of Book of Mormon Studies: Volume - 11, Issue - 1, Pages: 4-15 Provo, Utah: Maxwell Institute, 2002). However, it seems quite possible that these elements were part of the original Quetzalcoatl legend and were later associated with the famous king along with the rest of the Quetzalcoatl identity. The Maize God participated in the creation of the world when he “raised the sky in one phase of creation from the primordial sea…. This happened when he positioned the World Tree (or Tree of Life) at the center axis of the cosmos” (ibid.). The Maize God, like Quetzalcoatl, was said to have supplied the Indians with maize bread, their most important staple (ibid.). This is reminiscent of Jesus’ pronouncement, “I am that bread of life” (John 6:48). The Maize God “gave his blood and thereby caused maize to be reborn from seed. Maize is intrinsically involved with man because the Maya believed man to be made of maize” (“Quetzalcoatl, the Maya Maize God, and Jesus Christ,” Diane E. Wirth, Journal of Book of Mormon Studies: Volume - 11, Issue - 1, Pages: 4-15 Provo, Utah: Maxwell Institute, 2002). The Maize God was killed by the lords of the Underworld. These Lords of Death hung the Maize God’s decapitated head on a barren tree, which then bore fruit (ibid.). This is reminiscent of Apostle Peter’s condemnation of the Jews: “The God of our fathers raised up Jesus, whom ye slew and hanged on a tree” (Acts 5:30). It is possible that the image of a crucifix being like a tree far pre-dates Peter. Once the lords of the Underworld were defeated, the Maize God was resurrected from a split tortoise shell that represented the earth (“Quetzalcoatl, the Maya Maize God, and Jesus Christ,” Diane E. Wirth, Journal of Book of Mormon Studies: Volume - 11, Issue - 1, Pages: 4-15 Provo, Utah: Maxwell Institute, 2002). The visitation of Jesus Christ to the Americas, as accurately recorded in the Book of Mormon, lived on in the memory of the American Indians. While there were many aspects of false religion, polytheism, and paganism that crept in among the worship of Quetzalcoatl, it nevertheless preserved many of the essentials relating to the visit of Jesus Christ in the Americas. 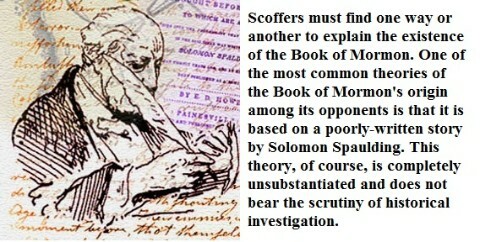 Among one of the most oft-repeated explanations for the Book of Mormon by its opponents is what has come to be known as the Solomon Spaulding Theory. Essentially the theory purports that the Book of Mormon was fabricated by Joseph Smith with the aid of Sidney Rigdon and a pilfered manuscript of a story written by a man named Solomon Spaulding. Solomon Spaulding was born in Ashford, Connecticut, on February 21, 1761. He was a minister for a brief time, until he lost his faith and then turned to a variety of vocations, none of them successful. He died in Pittsburgh in 1816, but before that he authored an unpublished, poorly written novelette of sorts now known as the “Spaulding Manuscript.” This story written by Spaulding has been claimed by enemies of the Church to be the source material which Sidney Rigdon provided to Joseph Smith, and with which Joseph Smith was supposed to have used to write the Book of Mormon. The reason Sidney Rigdon is singled out as the one connected to the Spaulding Manuscript is because he was the only one of Joseph Smith’s early associates seen by critics as having sufficient ministerial expertise to aid in writing the Book of Mormon, and because for a time he lived in the same vicinity as Solomon Spaulding, although after Spaulding had already died. (Daniel H. Ludlow, ed., Encyclopedia of Mormonism, p. 1402-1403). “There are similarities in the explanation for the origins of both Manuscript Found and the Book of Mormon. (Daniel H. Ludlow, ed., Encyclopedia of Mormonism, p. 1403). As for the seerstone element of the Manuscript, this was a fairly common element in nineteenth century rural New York and area, and was not unique to Joseph Smith (see Richard L. Bushman, Joseph Smith: Rough Stone Rolling, p. 48-52). And the first seerstone Joseph Smith had, he found in 1822 while digging a well with Willard Chase (ibid., p. 48), long before he would have been able to be influenced by the Spaulding Manuscript through Sidney Ridgon’s association. 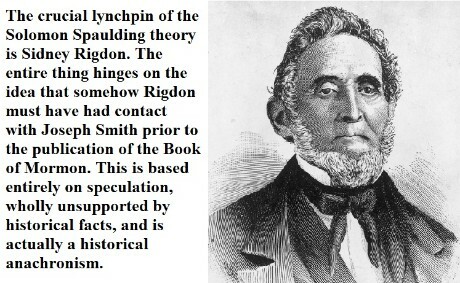 Of course, this Spaulding Theory is based entirely on speculation and historical anachronism, since Joseph Smith did not meet Sidney Rigdon until December 1830, after the Book of Mormon was published (History of the Church, 1:128). Joseph Smith maintained that late in the year of 1830 Sidney Rigdon was contacted by Mormon missionaries, “This being the first time [Sidney Rigdon] had ever heard of, or seen, the Book of Mormon” (History of the Church, 1:122), and there are no historical facts to contradict this statement. Thus the entire Solomon Spaulding theory rests on unfounded speculation, not based in fact whatsoever, that Joseph Smith must have had secret associations with Sidney Rigdon between New York, Pennsylvania and Ohio, as they prepared the Book of Mormon together. Oh, of course! Examination of Sidney Rigdon’s life shows that he did not have anything to do with the Book of Mormon prior to late 1830, after its publication. John W. Rigdon, the non-Mormon son of Sidney Rigdon, related in his book The Life of Sidney Rigdon, about Sidney’s first encounter with the Book of Mormon, that his father Sidney had only ever told one story relative to his finding the Book of Mormon: that in the fall of 1830, Parley P. Pratt, Ziba Peterson, Oliver Cowdery, and Peter Whitmer canvassed the home of Sidney Rigdon, and that that was his first encounter with the Book. His daughter Athalia, who witnessed the event, remembered the experience throughout her life. Later in Sidney’s life, upon serious questioning by his doubting son John, Sidney confirmed that he had nothing to do with the Book of Mormon before its publication, and that Joseph Smith was a true prophet. After Sidney’s death, John’s mother (Sidney’s wife) confirmed to John in all sincerity that the idea that Sidney Rigdon had anything to do with creating the Book of Mormon was simply not true. (see John W. Rigdon, The Life of Sidney Rigdon, p. 188-195 as quoted in B.H. Roberts, ed., History of the Church, 1:122-123). 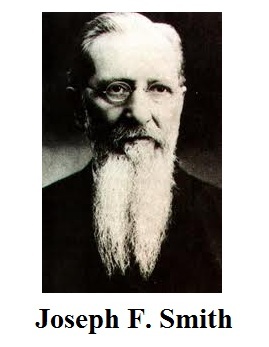 Sidney Rigdon, of course, is the crucial lynchpin of the Solomon Spaulding Theory because he was the one who was supposed to have retrieved the Manuscript for his and Joseph Smith’s use. How else could Joseph Smith have gotten his hands on the Spaulding Manuscript if not through Rigdon, who was in the general area of Spaulding? However, as has been demonstrated, this crucial piece in the theory crumbles under the weight of the truth. The truth of the matter is that the Spaulding Manuscript bears so little resemblance to the Book of Mormon, that many of the theory’s proponents adhere to the idea that there must have been a second Spaulding Manuscript that more closely resembled the Book of Mormon, and that this was the one which Joseph Smith and Sidney Rigdon would have used, even though no evidence for such a second manuscript exists whatsoever. How clever! 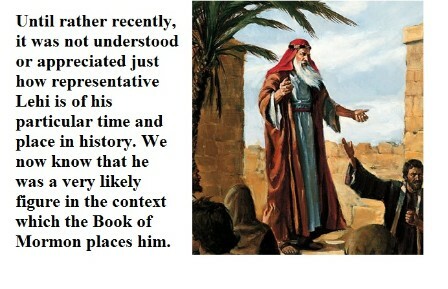 This sort of absurdity simply goes to show how desperate opponents of the Book of Mormon are to explain away the Book. They are so hard-pressed for a plausible explanation of the Book of Mormon, the impressive work that it is, that they keep coming back to this pathetic theory over and over again. 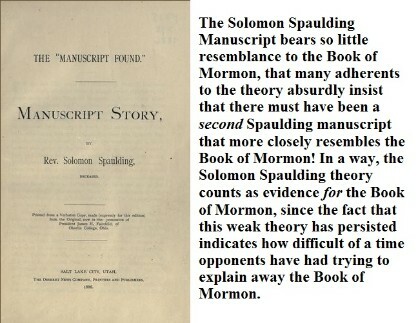 The fact that nothing more impressive than the Solomon Spaulding theory has come along as an alternative explanation for the Book of Mormon is itself evidence for its authenticity. The vast majority of the changes in the Book of Mormon were grammatical in nature, including correction of spelling errors, or corrections to errors committed by the printer with the typesetting. The latter, especially, is particularly innocent since such human errors would be very easy to commit with the available printing methods and technology. As a point of perspective, a certain edition of the Bible, afterward nicknamed “the Wicked Bible” had for the seventh commandment of Exodus 20:14, “Thou shalt commit adultery” (accidentally omitting the “not”). Therefore, typesetting errors were very easy to make, no matter whether the book was an inspired one or not. 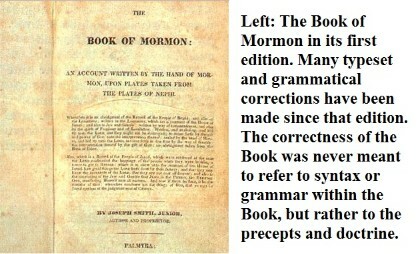 The grammatical changes to the Book of Mormon were made to make the Book conform more closely to proper and modern English and to make the spelling uniform. Interestingly, the original text of the Book of Mormon, before these “corrections,” was much more prone to Hebraisms (i.e. structural elements suggestive of Hebrew or a similar language). Some of the changes were authorized additions to the text by the Prophet Joseph Smith, made purely for the purpose of clarifying the Book’s intended meaning for the reader. All of the changes to the text of the Book of Mormon were minor in nature, and none of them changed the meaning of the text or changed doctrinal teachings of the Book. None of this is hidden information. Every 1981 edition of the Book of Mormon (today’s current edition) has within it this note after the testimony of the witnesses and just before the table of contents: “About this edition: Some minor errors in the text have been perpetuated in past editions of the Book of Mormon. This edition contains corrections that seem appropriate to bring the material into conformity with prepublication manuscripts and early editions edited by the Prophet Joseph Smith.” In addition to this, in a recent Ensign issue that was entirely about the Book of Mormon, a section discussed the nature of the changes made to the Book of Mormon (see Ensign, October 2011, p. 79). Of course, the claim that the Book of Mormon cannot be the most correct book on earth because of the changes to the text is very misleading. The Book of Mormon does not claim to be without human error. On its title page, written anciently by Moroni, it reads, “And now, if there are faults [in this Book] they are the mistakes of men; wherefore, condemn not the things of God, that ye may be found spotless at the judgment-seat of Christ.” The correctness of the Book of Mormon was never meant to refer to its grammar or syntax. But rather, the correctness of the Book of Mormon is found in its principles and doctrine. When the angel Moroni was describing the ancient record of the Book of Mormon to Joseph Smith, the angel told him “that the fulness of the everlasting Gospel was contained in it” (JS-H 1:34). Elsewhere in the scriptures we are assured that the Book of Mormon “contain[s] the fulness of my everlasting gospel” (see D&C 27:5; 135:3). Opponents of the Book of Mormon likewise latch onto this claim in an effort to demolish the image and credibility of the Book of Mormon. They reason that the Book of Mormon cannot live up to the claim of having the fullness of the gospel because many uniquely Mormon doctrines are not in the Book. This is also a misleading Straw Man argument (i.e. an argument wherein rather than an accurate depiction of another party’s claim is rebutted, a false, silly caricature of the other party’s claim is instead put forth as their claim, and then this is what is rebutted instead). What does it mean that the Book of Mormon contains the fullness of the everlasting gospel? It is clear therefore, that when the Lord said that the Book of Mormon contains “the fulness of my everlasting gospel” (D&C 27:5) it means that the Book of Mormon contains the fullness of doctrine necessary to get on that path which leads to eternal life. (Joseph Smith, Teachings of the Prophet Joseph Smith, p. 264). (Hugh W. Nibley, Since Cumorah, p. 81). Of course, this entire issue is a bit of a moot point, since if one accepts the Book of Mormon, then they accept that the Gospel of Jesus Christ has been taught in plainness since the beginning, as it says, “For, for this intent have we written these things, that they may know that we knew of Christ, and we had a hope of his glory many hundred years before his coming; and not only we ourselves had a hope of his glory, but also all the holy prophets which were before us” (Jacob 4:4). (Daniel H. Ludlow, A Companion to Your Study of the Book of Mormon, p. 163). What is perhaps just as, or even more, ridiculous of an objection as the “adieu” thing, but nevertheless an oft-used objection, is with regards to the claimed location of Christ’s birth. It is a well known fact that Jesus Christ was born in Bethlehem. As the Bible famously recounts, “And Joseph also went up from Galilee, out of the city of Nazareth, into Judæa, unto the city of David, which is called Bethlehem” (Luke 2:4). Elsewhere the Bible says plainly, “Jesus was born in Bethlehem of Judæa in the days of Herod the king” (Matthew 2:1). This was such common knowledge that all the people, past and present, understood that the Christ was to be born in Bethlehem. In fact, this became a point of contention with those who disbelieved in Jesus’ divinity, since they thought He was born in Nazareth. As the scriptures recount, “But some said, Shall Christ come out of Galilee? Hath not the scripture said, That Christ cometh of the seed of David, and out of the town of Bethlehem, where David was?” (John 7:41-42). What are the chances that Joseph Smith (assuming that he wrote the Book of Mormon) would be ignorant about the birthplace of Jesus Christ, the Christmas story? It is one of the best-loved stories of the Bible, and is known even to little children. How could Joseph Smith have made such an incredible oversight on such a simple matter, and yet nailed other historical Bible facts, that are far more obscure, dead on? The Book of Mormon does not claim the city of Jerusalem as the birthplace of Christ, but only “at Jerusalem which is the land of our forefathers” (Alma 7:10) or in other words, the general area of the land of Jerusalem. 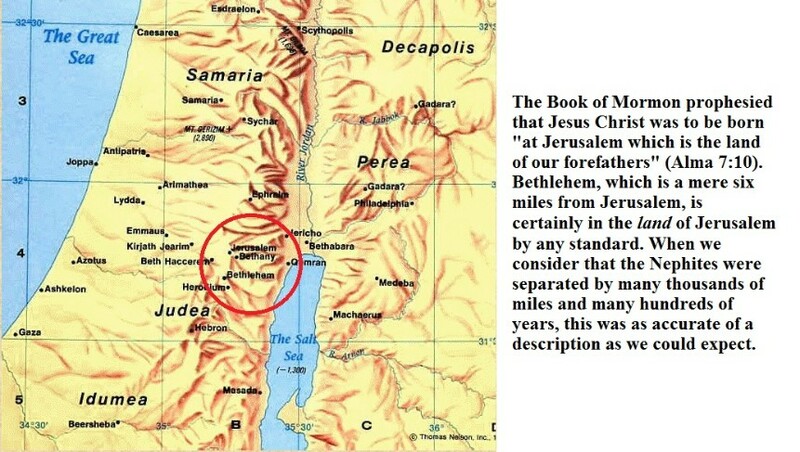 This makes incredible sense, since Jerusalem is geographically very close to Bethlehem and this prophecy was given around 83 B.C., some 517 years since the Book of Mormon people left Jerusalem to travel to the other side of the world. The small town of Bethlehem would have had very little meaning to the Book of Mormon peoples, who could have had no more than a very vague understanding of the geography of Palestine – if any understanding at all. But they did know that their forefathers came from a city across the sea called Jerusalem. Therefore, in order to put this prophecy in a context that would be meaningful to its hearers, Alma designated that the Christ would be born in “the land of our forefathers,” or the land of Jerusalem. One objection that is sometimes raised against the Book of Mormon is its claim of what appears to be quick and explosive population growth. As Nephi chronicles, “And it sufficeth me to say that forty years had passed away [since they left Jerusalem], and we had already had wars and contentions with our brethren” (2 Ne. 5:34). How is it that after only forty years there could be such a population as to conduct wars? First of all, we should remember that there were several people in Lehi’s family at the time they left Jerusalem: Lehi and Sariah and four sons. There was also Zoram, their travelling companion from the house of Laban, and the entire family of Ishmael, which has every indication of being quite sizable. Then Lehi and the others continued to have children during their years of travels. Then the group finally arrived on the promised land and separated into factions. Perhaps the “wars” that Nephi mentioned might be more properly thought of as tribal conflicts rather than full-scale military operations reminiscent of a highly progressed civilization. Nevertheless, demographic researcher James E. Smith concluded of the Book of Mormon, “Like other ancient texts, the Book of Mormon presents sparse and incomplete data regarding population sizes…. nevertheless, some plausible demographic inferences can be made, and the picture of Nephite population history that emerges is a realistic one” (James E. Smith, Book of Mormon Authorship Revisited: Evidence for Ancient Origins, Noel B. Reynolds, ed., p. 287). Another fairly common objection to the Book of Mormon is the matter of the Nephite monetary system. Within the Book of Mormon is a detailed description of the Nephites’ several values for money in gold, silver (and grains), often assumed by the reader to be referring to coins (see Alma 11:4-19). Even the chapter heading refers to “Nephite coinage.” However, there is a problem with this, because evidently coins were not used in Mesoamerica prior to Columbus, for none have ever been found. Nephite ‘money’ was probably noncoined. The “onti” of Alma 11:22 “is an Egyptian word meaning ‘small amount’ or ‘short of an amount.’” (Diane E. Wirth, A Challenge to the Critics: Scholarly Evidences of the Book of Mormon, p.47). The “senum” of Alma 11:3 is related to the Egyptian sen which means “one-half” or “doubling.” This corresponds with the value of senums in the Book of Mormon. (ibid.). The “limnah” of Alma 11:5 has the Hebrew meaning of “to count or weigh.” (ibid.). The “shiblum” of Alma 11:16 was written as “shilum” on the Original and Printer’s Manuscripts of the Book of Mormon, the earliest transcripts of the sacred record. Shilum is a Hebrew word that means “payment, reward, or retribution.” (ibid., p.48). (As quoted in Craig L. Foster, “Henry Caswall: Anti-Mormon Extraordinaire,” BYU Studies, vol. 35, #4, 1996). Note the overly ignorant and stupid intellect Caswall attributes to Joseph Smith. Also note how out of character this is for the surviving writings and teachings of the Prophet Joseph Smith. Note the totally out of place reference to reformed Egyptian, a writing that was unique to Book of Mormon writers and not generally known. And finally, note also, and note well, that all of this is based soley off of Caswall’s testimony, who had a definite agenda. And yet this sort of foolish story has been swallowed by anti-Mormons for generations as proof positive that Joseph Smith was a fraud! 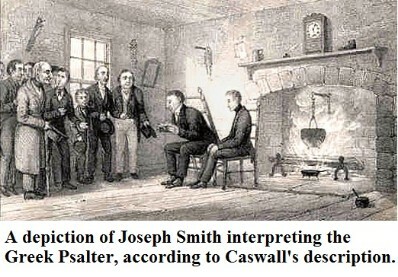 Caswall also changed several details of the story of his encounter with Joseph Smith. Despite the obvious issues with this story, this silly story has been regarded as the “most effective single contribution to anti-Mormon literature” (ibid.). Simply amazing. Another episode that opponents to the Book of Mormon try to use against it is the incident in Church history involving the Kinderhook plates. This story, like the Greek Psalter incident, is also used by opponents to call into question Joseph Smith’s translation ability. In April of 1843, some interesting, ancient-looking plates supposedly found in Kinderhook, Illinois were taken to Joseph Smith for him to translate. Supposedly “found” by Robert Wiley, in actuality these plates were a hoax crafted by Wiley and a blacksmith named Bridge Whitton, and no doubt were meant as a trap for the Prophet Joseph Smith. Curiosity surrounding the Kinderhook plates abounded in Nauvoo, and it is apparent that the Prophet viewed them, but as the Times & Seasons reported, “Mr. Smith has had those plates, what his opinion concerning them is, we have not yet ascertained” (History of the Church, 5:373). 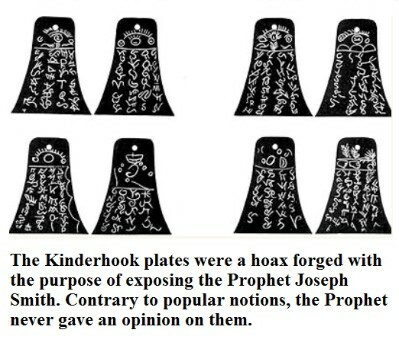 At no time did the Prophet Joseph Smith ever give a documented opinion of the Kinderhook plates. the breast of the skeleton, and were covered on both sides with ancient characters. (History of the Church, 5:372). of what others felt would be helpful to print. The Clayton journal excerpt was one item used in this way. It seems that unfortunately rumor and speculation got the better of William Clayton, and he interpolated a statement that he had heard indirectly (and falsely) had come from the Prophet Joseph Smith. Also, the supposed interpretation of the plates, which claims a Hamitic (i.e. Negroid) origin makes no sense. Why would Blacks be in Kinderhook, Illinois in ancient times? Even in the paradigm of Mormonism, this is a strange circumstance. Nevertheless, this mistake of falsely attributing a comment about the Kinderhook plates to Joseph Smith has given dishonest opponents of the truth some ammunition to sway the opinion of the unsuspecting and uninformed. Other aspects of the incident of the Kinderhook plates indicate that, while there was excitement over the plates in Nauvoo, Joseph Smith had very little interest in them. Consider that when Joseph Smith came across the Egyptian papyri from which the Book of Abraham was translated, he was willing to plunge the Church into debt in order to obtain them. But with the Kinderhook plates, there was no such interest displayed on his part. Also, if the whole point of the Kinderhook plates was to expose Joseph Smith as a fraud, why then did the whole thing die out rather quietly? Why did not the hoaxsters turn around and immediately expose Joseph Smith loudly and publicly? The reason of course, is because Joseph Smith made no comment about the Kinderhook plates, and there was nothing to expose. Neither the Greek Psalter nor the Kinderhook plate episodes have been able to demonstrate any falsehood in the Prophet Joseph Smith. Neither story in no way threatens the veracity of the Prophet’s power and ability to translate ancient records. Opponents of the Book of Mormon seek high and low to undermine the translating power of the Prophet Joseph Smith, but in this they are grasping at straws. The most recent challenge to the Book of Mormon’s authenticity has come from interpretations of scientific research involving the DNA of American Indians. 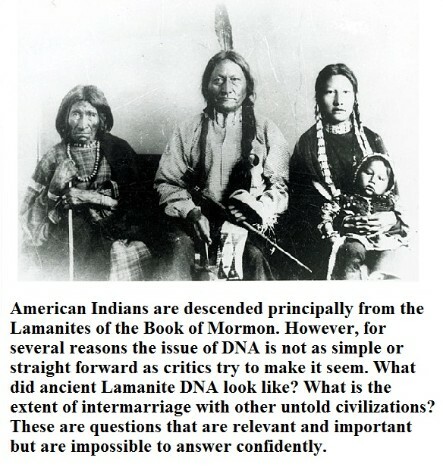 In February 2006, an article in the Los Angeles Times claimed that DNA evidence suggests an Asian origin for the American Indians, rather than a Jewish one, insinuating that the Book of Mormon cannot therefore be true. For some, this shook the very bedrock of their faith. But is the situation really as open-and-shut as the columnist of the Los Angeles Times suggests, and that the Book of Mormon is hereby falsified? Or does the truth present a different, more complicated scenerio? Because of the accuracy of DNA testing in criminal court cases, many are left with the impression that this must be a slam dunk for the critics, demonstrating that the Book of Mormon cannot be true. However, determining ancestry through DNA study is quite a different ballgame from forensic DNA matching. It is far more subjective and based on assumption. As John M. Butler, genetics and DNA specialist, explained, “In ancestry studies, DNA information from multiple modern population groups is projected over many generations between populations tested. Even though the same genetic markers may be used as in forensic DNA testing, in ancestry testing there is usually not a one-to-one unique match being made. Instead, scientists are often guessing at what genetic signatures existed in the past based on various assumptions—with a bit of educated ‘storytelling’ to fill in gaps” (“Addressing Questions surrounding the Book of Mormon and DNA Research,” John M. Butler, FARMS Review: Volume - 18, Issue - 1, Pages: 101-108, Provo, Utah: Maxwell Institute, 2006). And how do we tell how those samples of ancient peoples appeared genetically? Butler continues, “it is important to keep in mind that reference samples are always needed to provide relevant results with any kind of DNA testing. If a reliable reference is not available, confident conclusions cannot be made” (ibid.). Revisited: Evidence for Ancient Origins, Noel B.
John M. Butler mentioned, “Events related in the Book of Mormon likely took place in a limited region, leaving plenty of room for other Native American peoples to have existed” (“Addressing Questions surrounding the Book of Mormon and DNA Research,” John M. Butler, FARMS Review: Volume - 18, Issue - 1, Pages: 101-108, Provo, Utah: Maxwell Institute, 2006). There is no need to be restricted to or even expect that the Book of Mormon chronicles every civilization on the American continent from 2200 B.C. to 421 A.D.
dominant blood-type is O, that being found among 91.3 percent of the pure-blooded North American Indians. (Hugh W. Nibley, Since Cumorah, p. 214-215). “An interesting study reported in the June 2003 issue of the American Journal of Human Genetics leads me to believe that it is possible for Book of Mormon peoples to be ancestors of modern Native Americans and yet not be easily detected using traditional Y-chromosome and mitochondrial DNA tests. 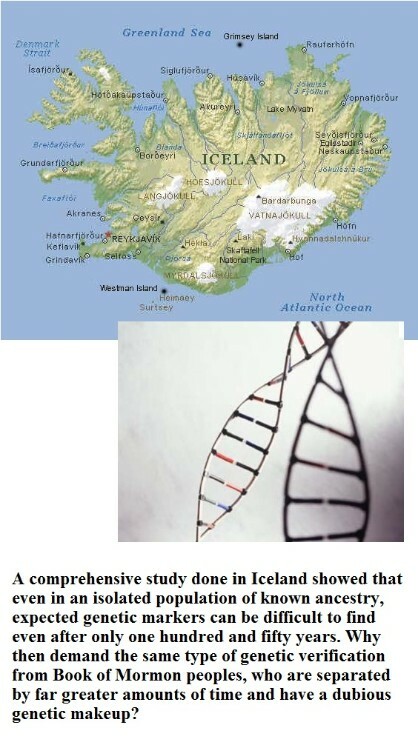 This study, conducted by a group of scientists from a company called deCODE Genetics, used the extensive genealogies of people from Iceland combined with probably the most massive population study ever performed. They traced the matrilineal and patrilineal ancestry of all 131,060 Icelanders born after 1972 back to two cohorts of ancestors, one born between 1848 and 1892 and the other between 1742 and 1798. (John M. Butler, “Addressing Questions surrounding the Book of Mormon and DNA Research,” The Book of Mormon and DNA Research, Daniel C. Peterson, ed. http://maxwellinstitute.byu.edu/publications/books/?bookid=106&chapid=1187 retrieved Jan. 18, 2012). The DNA “evidence” against the Book of Mormon is simply a case of data that is irrelevant to the issue being inappropriately applied to the question of the Book of Mormon ancestry. With the test groups that the scientists were using the entire thing starts off on the wrong footing. One familiar with the Book of Mormon would not have expected the Indians to be genetically similar to modern Jews. The peoples of the Book of Mormon were principally from the tribe of Manasseh through the loins of Joseph, not Judah. And those who did arrive in America among the descendents of Judah (the people of Mulek – King Zedekiah of Judah’s son), were a rather inconsequential grouping of peoples. As mentioned, the Book of Mormon does not discount the possibility of other peoples, such as Asians, mixing with the Lamanites at some point in history. It appears that this is what happened at least with the Inuit (i.e. Eskimos) of the Arctic. In short, we wouldn’t expect the American Indians, who are descendents of the Lamanites and therefore descended from Joseph through Manasseh in antiquity, to resemble the DNA of modern Jews any more than we would for Anglo-Saxons, who were descendents of Joseph through Ephraim, to resemble the DNA of modern Jews. The Book of Mormon is most certainly an authentic ancient scripture of great importance. This fact is substantiated from various lines of evidence: spiritual, physical, textual, and archeological. This greatly bolsters the claim that the Book of Mormon is true, and even more forcefully lays upon its readers the responsibility of believing it, as the Book says, “And when ye shall see these sayings coming forth among you, then ye need not any longer spurn at the doings of the Lord, for the sword of his justice is in his right hand; and behold, at that day, if ye shall spurn at his doings he will cause that it shall soon overtake you” (3 Ne. 29:4). These evidences are powerful and work to the condemnation of any who choose to reject the Book of Mormon. But these evidences also work to build the faith of those who choose to believe the truth. Nevertheless, it is not by virtue of these interesting evidences that we arrive at a conviction of the Book of Mormon’s truthfulness. But it is by a revelation from heaven to the heart and mind of every sincere and honest seeker who reads the Book of Mormon (see Moro. 10:3-5; D&C 8:2).